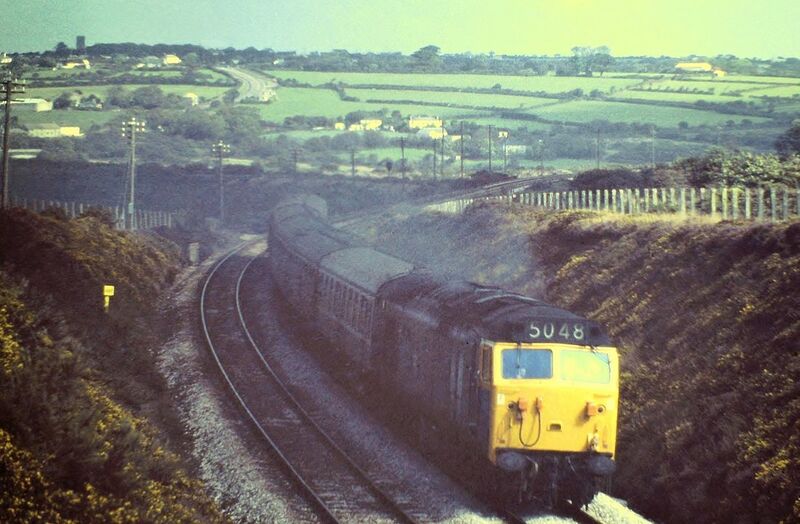 ​Doubling the main line between Redruth and Scorrier. This most interesting picture of Scorrier is from the Alan Harris Collection. 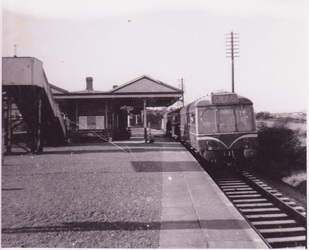 Note the token catching horn at the end of the up platform. 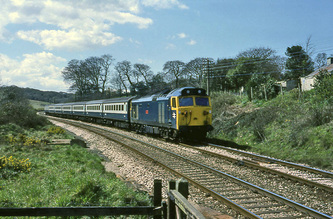 Also see comments below by Roy Hart. 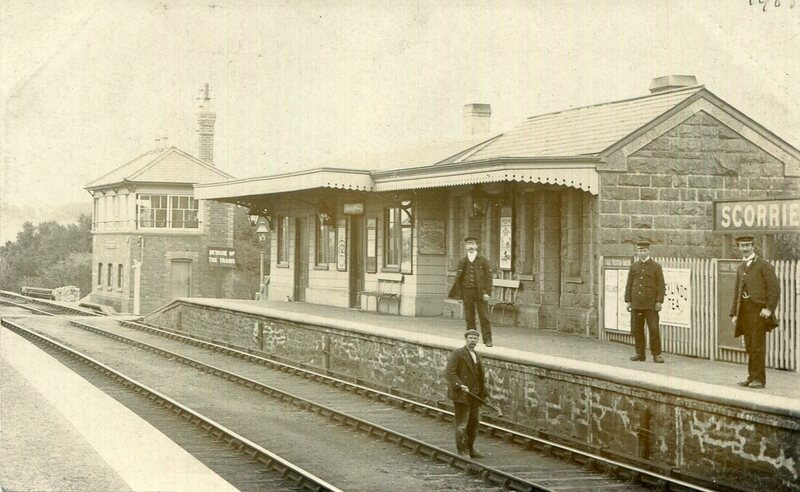 Roy Hart writes :- The above picture dates from the 1900s and shows the old signal box, which opened in 1902 and closed in 1930, when the line to Drump Lane Redruth was doubled. 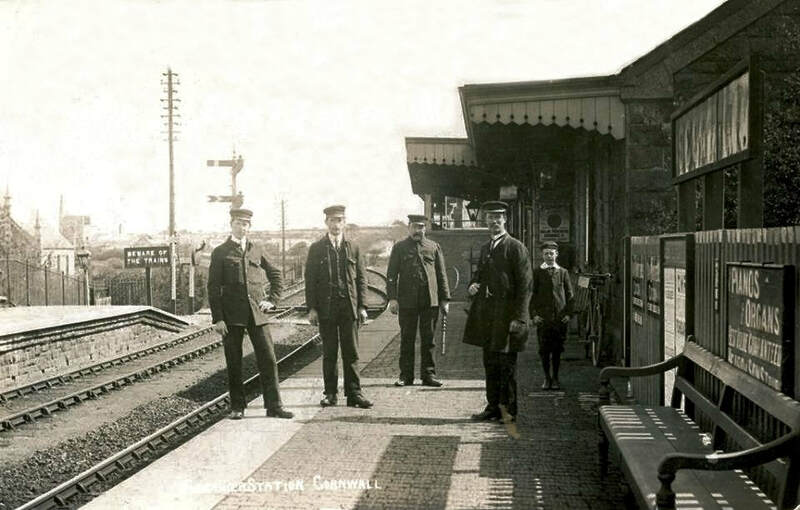 The signalman is holding the bulky electric train staff for the section to Redruth station (I suspect that this picture was taken before 1911 when Drump Lane box and yard opened). 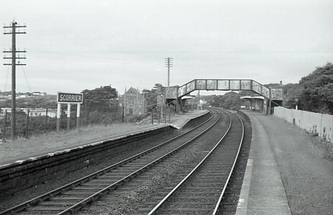 Scorrier box controlled only the single line points and a crossover and siding in the background of the picture. 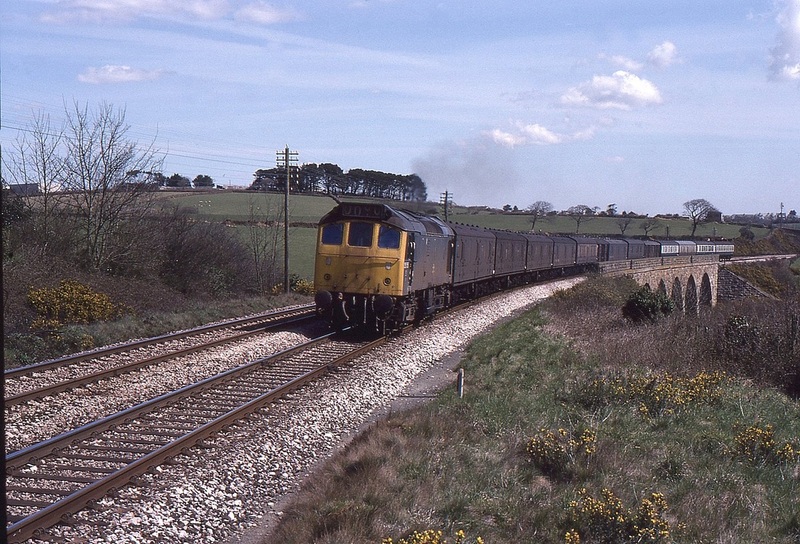 The siding was a 'refuge' so that a slow down freight, for example, could be shunted for a down express to pass on to the single line. 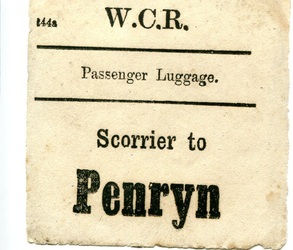 The 1929 Loans and Guarantees Act provided government money for 'improvements' and Scorrier to Drump was doubled; this left Scorrier box with no real function, so nearby Wheal Busy box was upgraded and Scorrier box closed. 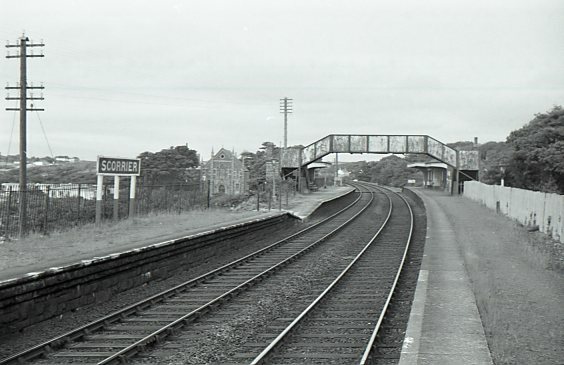 Scorrier - from the Paddy Bradley Collection. Scorrier area the line was single on towards Redruth on the bottom of the map. 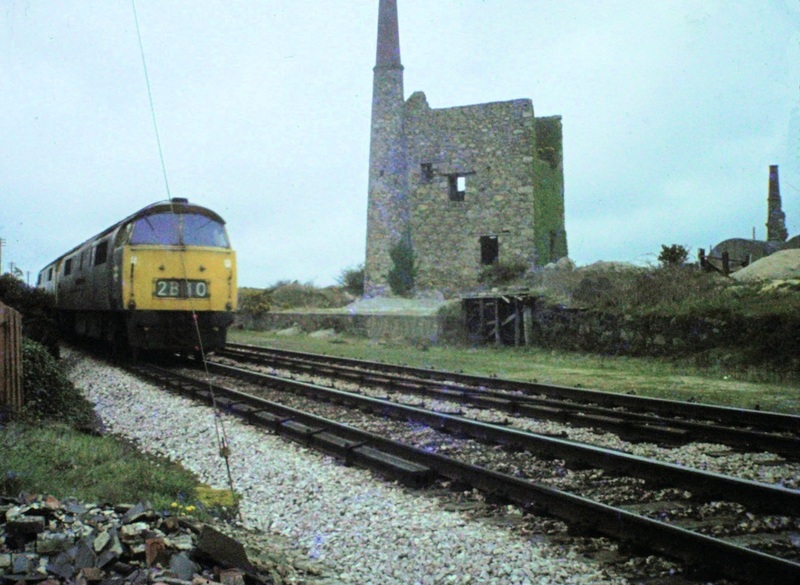 Wheal Busy Signalbox was just off the map at the top. 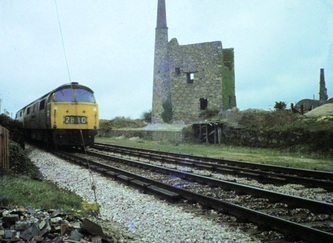 The Poldice tramway passed across the station approach and under the main line on its way towards Portreath. 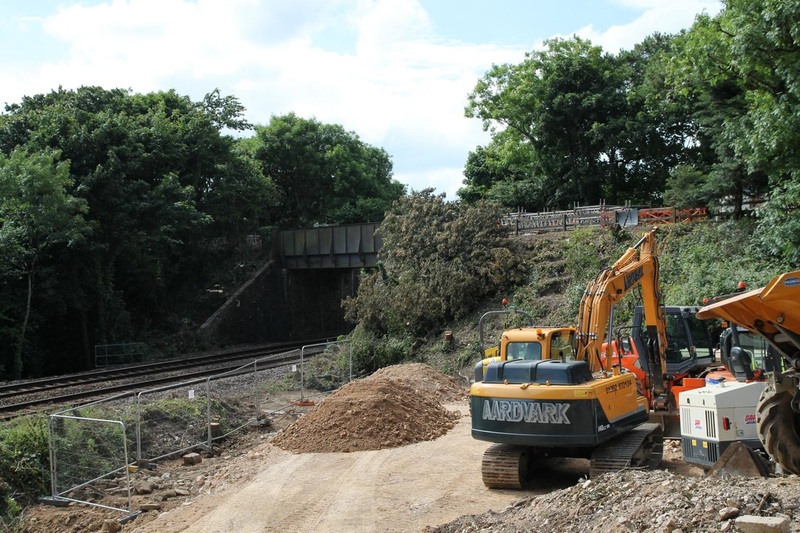 The course of the tramway is now completely lost for nearly half a mile. In contrast the tramway heading towards Poldice ran along what is now a public road. 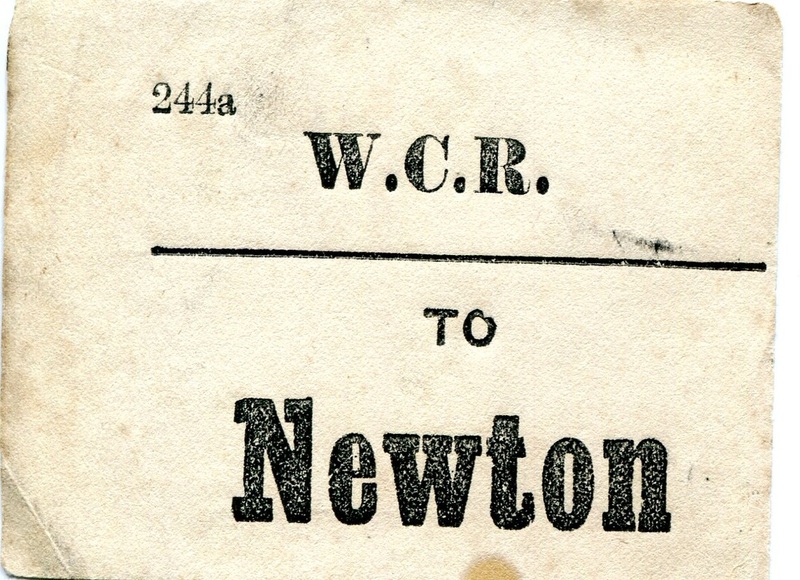 On the bottom right on the map the tramway can be seen separate from the road - the course of which is now a cycleway. Courtesy of the 25 inch OS map, with permission of the National Library of Scotland. Another enlarged view of the map above courtesy of the National Library of Scotland. 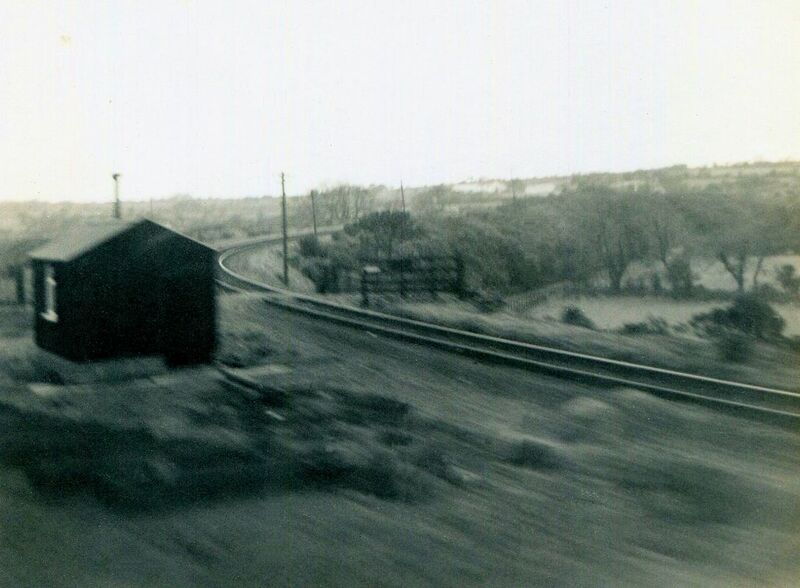 The Portreath - Poldice Tramway passed under the main line where it says 'old shaft' on its way towards Portreath. Looking to the east, Poldice direction, a road now follows the course of the tramway. The buildings of the Fox and Hounds pub can be seen. 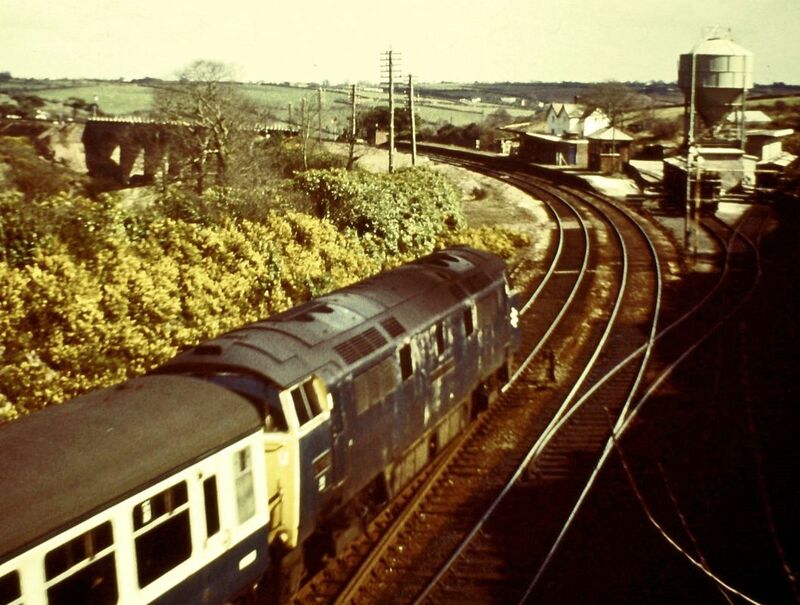 Of these, the extreme left extension housed for many years the 'Directors Saloon' - an open truck fitted with bench seats now located in Truro Museum. A very well manicured garden set in a piece of land bordered by Scorrier station approach, from which this picture is taken, and the public highway which at this point bends to pass under the main line. 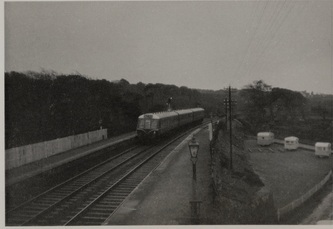 To the right lay the trackbed of the Portreath to Poldice Tramway which had originated at Poldice mine and passed at road level the Fox and Hounds. 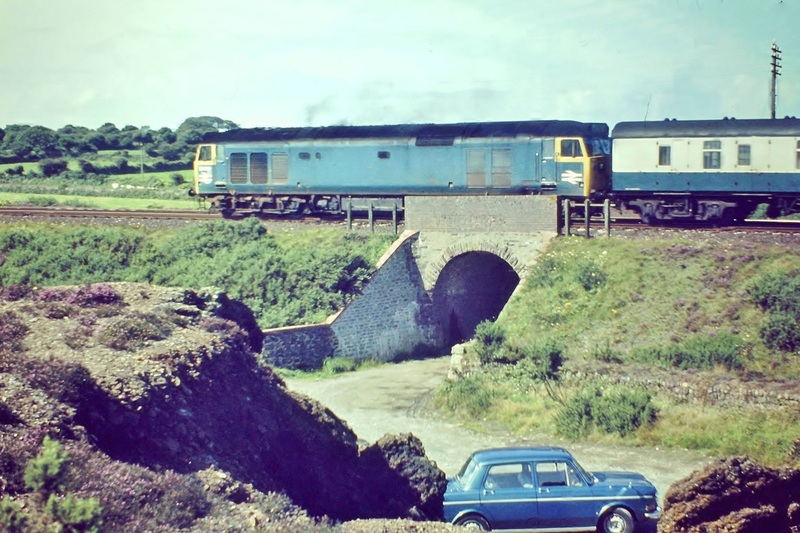 The tramway continued to pass under the main line by means of a curious skew bridge which also carried the platforms above and headed towards Portreath. In the background can be seen the Fox and Hounds Public House. The Poldice Tramways Directors Truck was found in a shed to the rear of the Fox and Hounds long after the tramway it was closed - it was derelict and abandoned in 1866-7. this is now in Truro Museum. 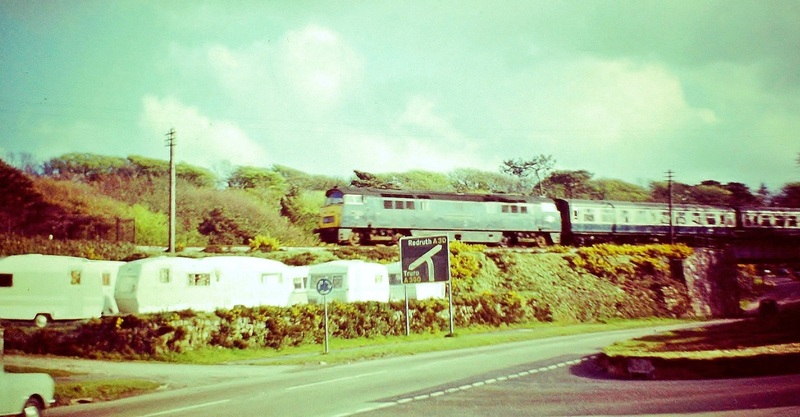 In later years this garden site was occupied by a large mobile home in which it is believed the Scorrier Station Master Jack Cantell and his son John lived. We are indebted to Mervyn Munday, one time 'Mine Host' at the Fox and Hounds' for this information. One wonders if the gentlemen posing in this picture are Father and Son? 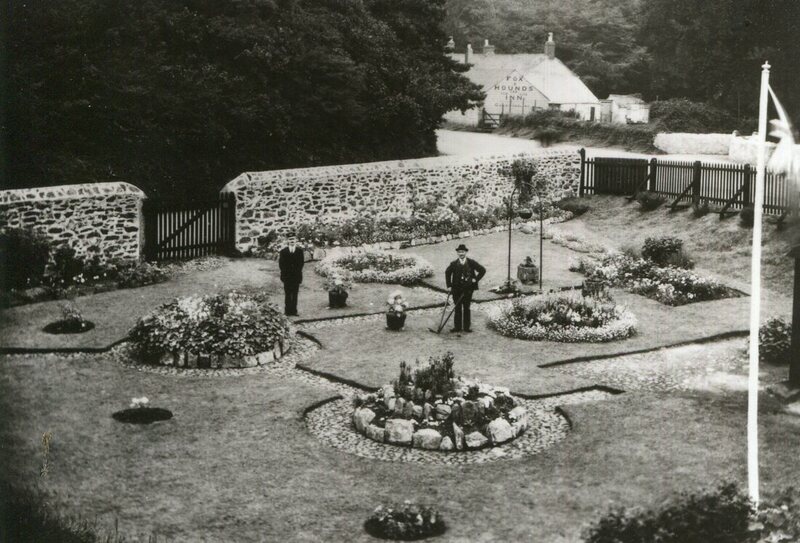 The site once the ornamental garden and then a site for a caravan is now the location of a well appointed house. 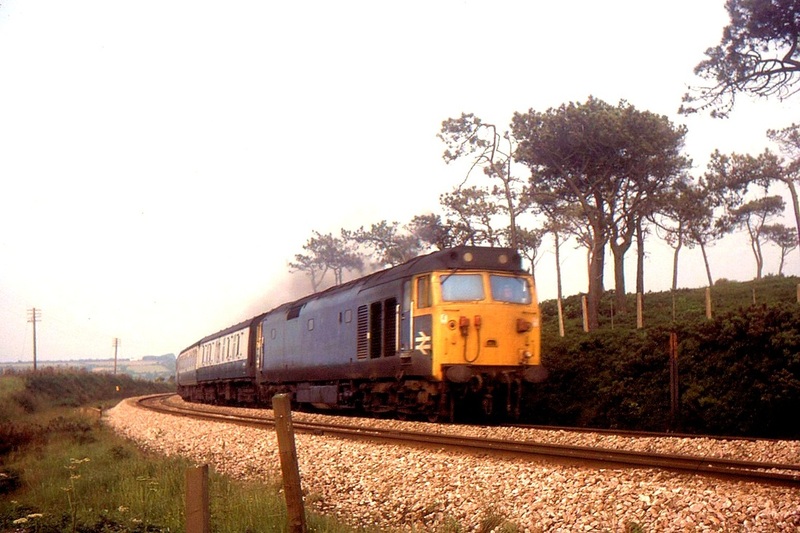 As to a date for the picture Roy Hart suggests - I notice in the corner of the picture that the flag is flying. Are we celebrating an event, I wonder? Going by the oufits, could be Queen Victoria's Jubilee (1897) or maybe Edward VII coronation (1902). 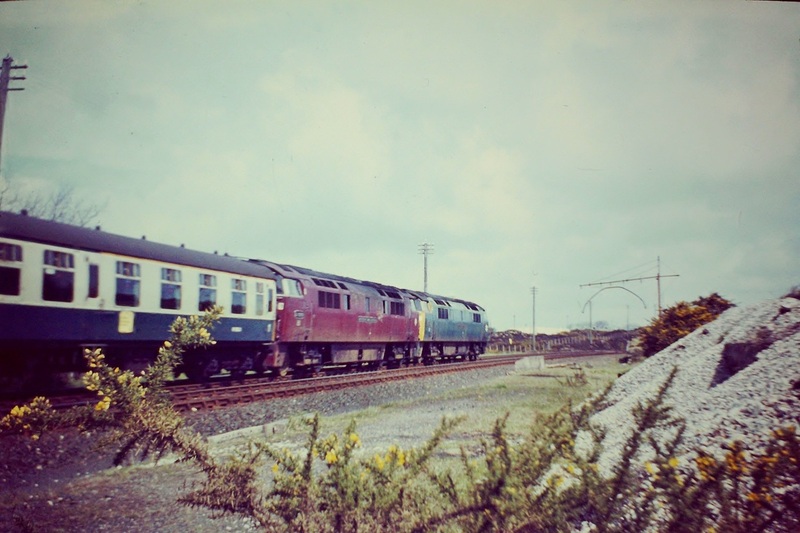 Picture from the Paddy Bradley Collection. 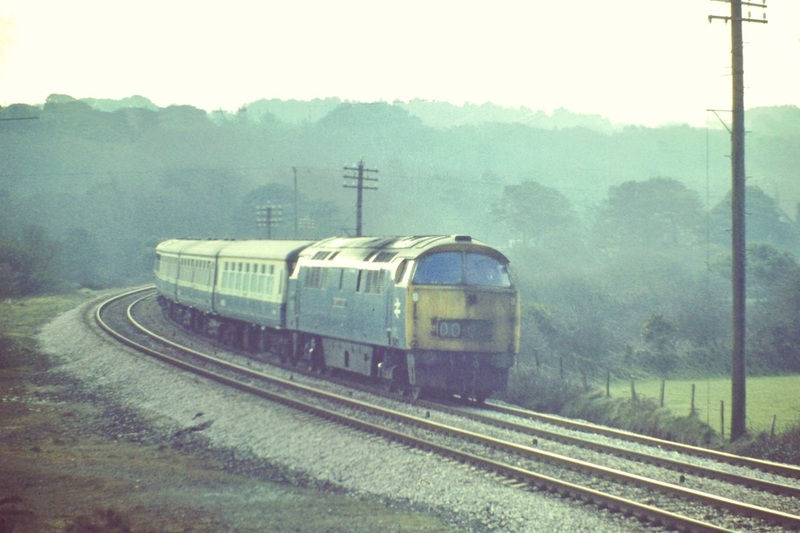 The view from Treleigh bridge, which incidentally replaced a level crossing many years ago one looks east as an HST approaches with a down service. 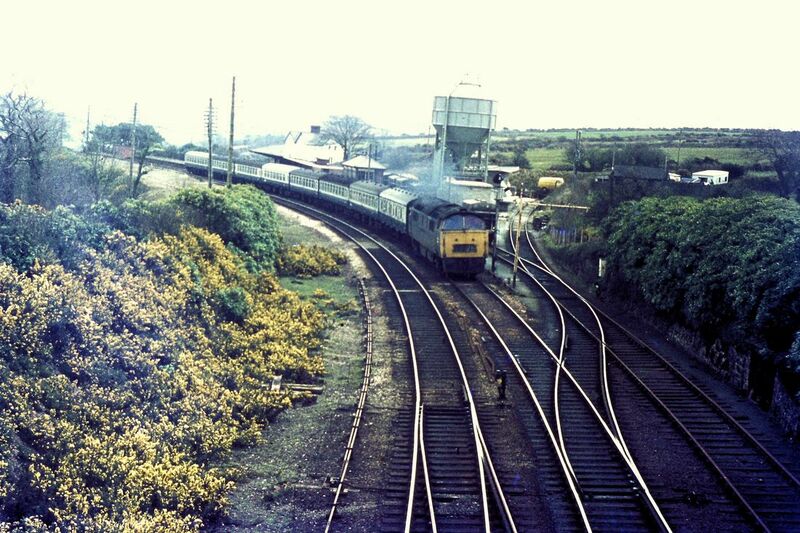 Interestingly one can see two pedestrian level crossings in this picture. 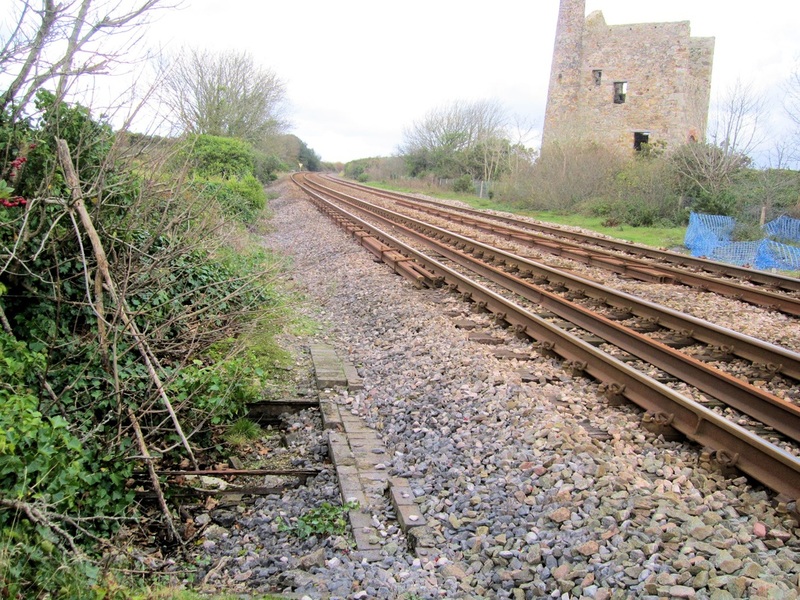 The first soon after the whistle board is at Wheal Bois - this seems to have gone out of use. 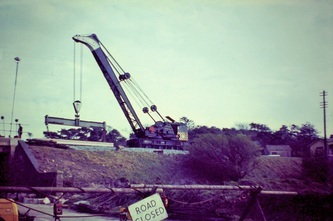 Further on just before the cutting lies a crossing known locally as 'Shallow Adit', so named as a stream emanating from a nearby mine flows alongside the approach lane to the crossing. 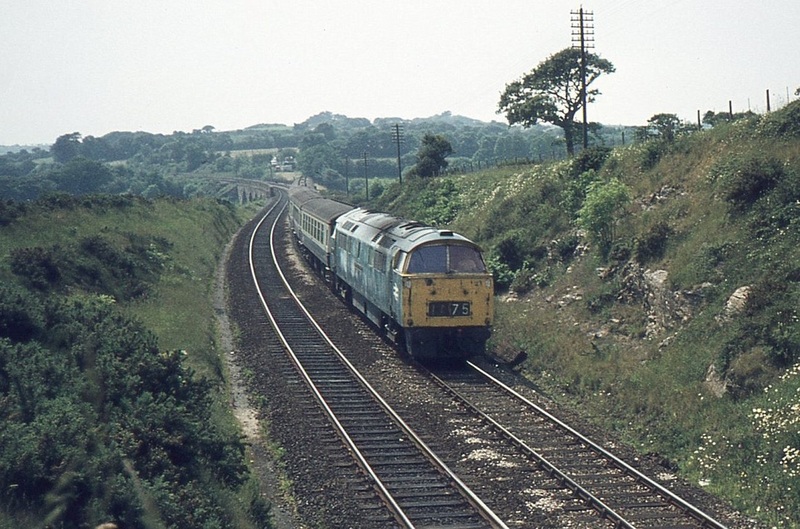 This picture dated 27th June 1984 is by Mike Roach Copyright. 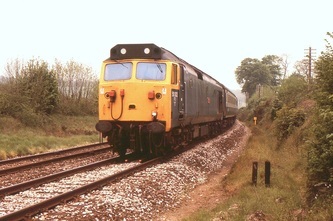 57604 on it first 2C51 with 17.50 from Exeter. 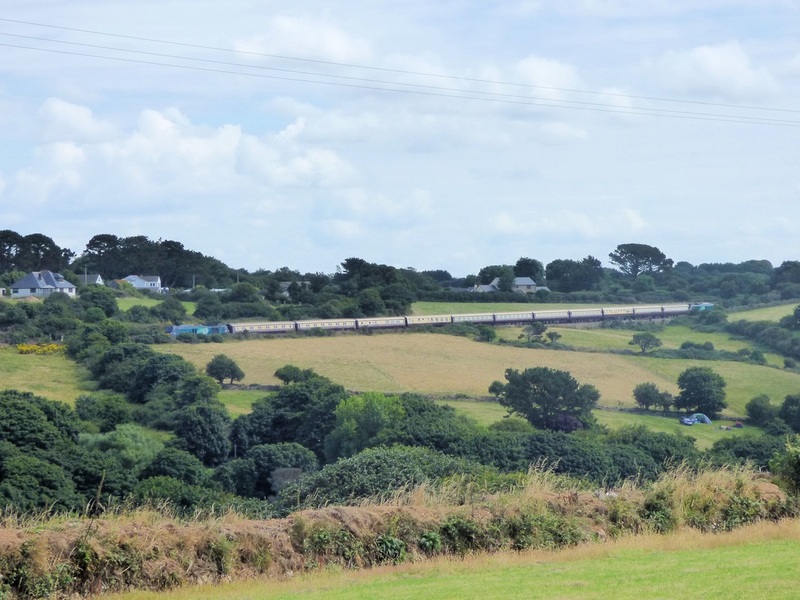 18th July 2015 Copyright Craig Munday A privileged shot taken by Craig of Pendennis Castle having just passed over Shallow Adit Crossing. Scorrier station down platform still extent on the 14th January 2017. 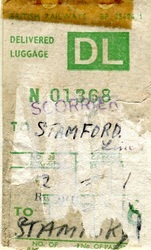 It closed on 5th October 1964. 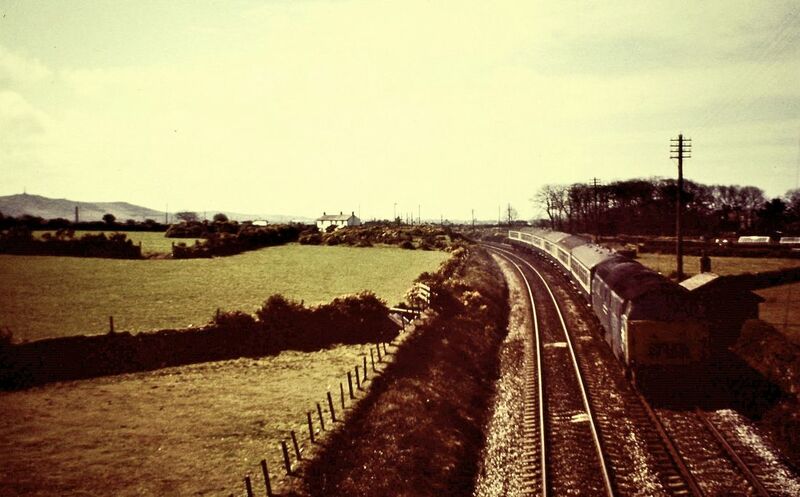 A privileged picture taken by Craig Munday, copyright. 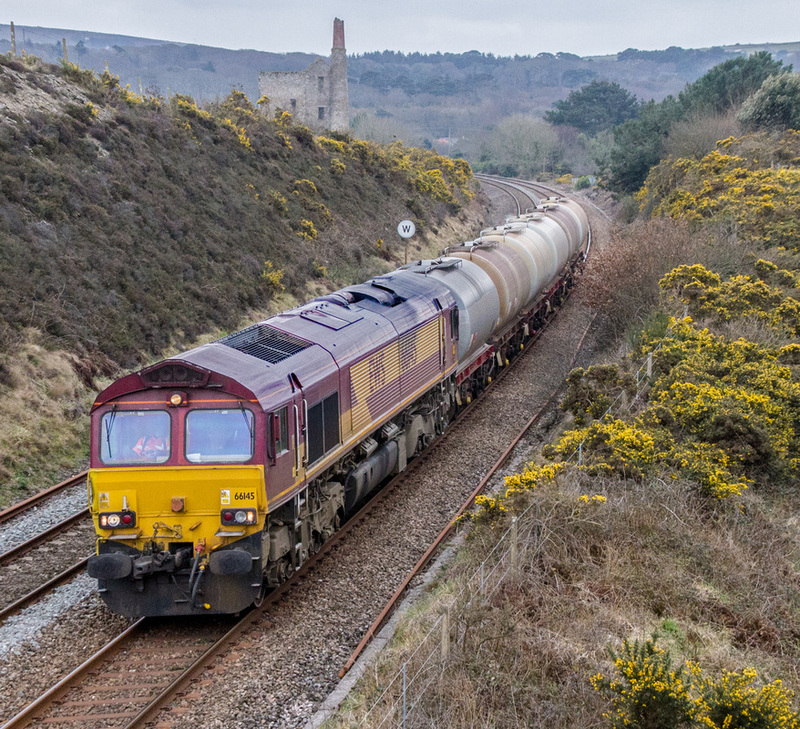 An up train headed by a D800 approaches Wheal Busy Box. The signals controlled the exit from the loop and the down main respectively. Copyright Movern Munday. This unforgettable name appears again and again on the CRS website, because of the splendid setting for photography. 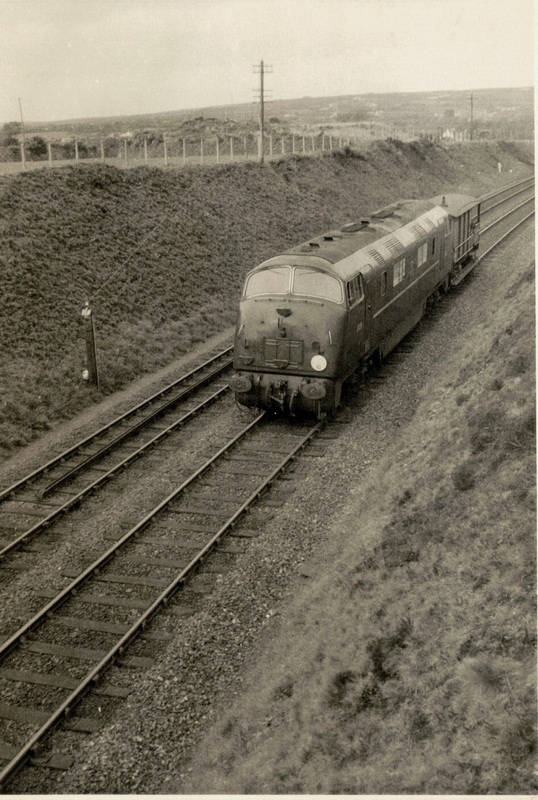 Readers may like to know a little more about this site and its relationship to the railway. 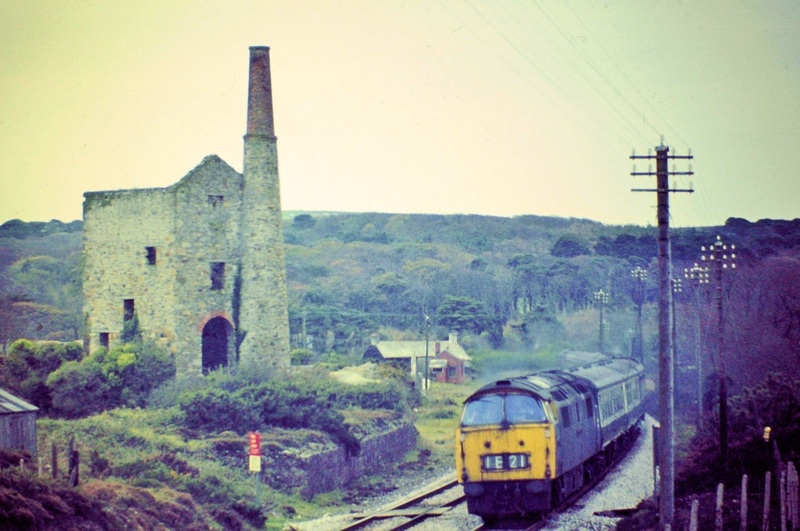 Hallenbeagle was a copper mine and the engine house familiar to us all housed the pumping engine for Read’s (sometimes written Reed’s) shaft. The mine reached its peak of production during the copper ‘boom’ years of the 1840s, but closed after the slump of 1866-7. Though abandoned, the shaft remained dry because it is drained by the County Adit (this is a network of tunnels originated by Williams of Scorrier in the eighteenth century to drain mines in the Gwennap area into the Carnon river; it still functions to this day, debauching up to half a million gallons daily). Read’s shaft was reopened for a period during world war 2 for the extraction of tungsten, but otherwise has been derelict since 1867. 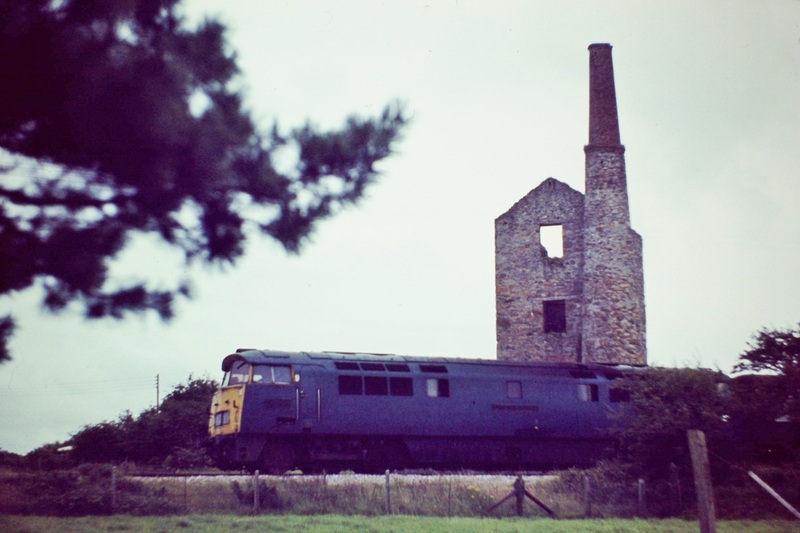 The Hallenbeagle sett was located in Kenwyn parish: across the tracks was Wheal Rose, which had rather a longer life and survived into the era of tin after copper declined. 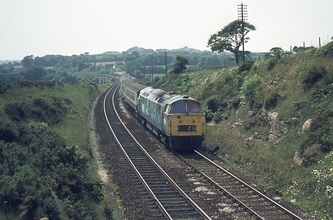 The single track West Cornwall Railway was opened through the site in 1852. 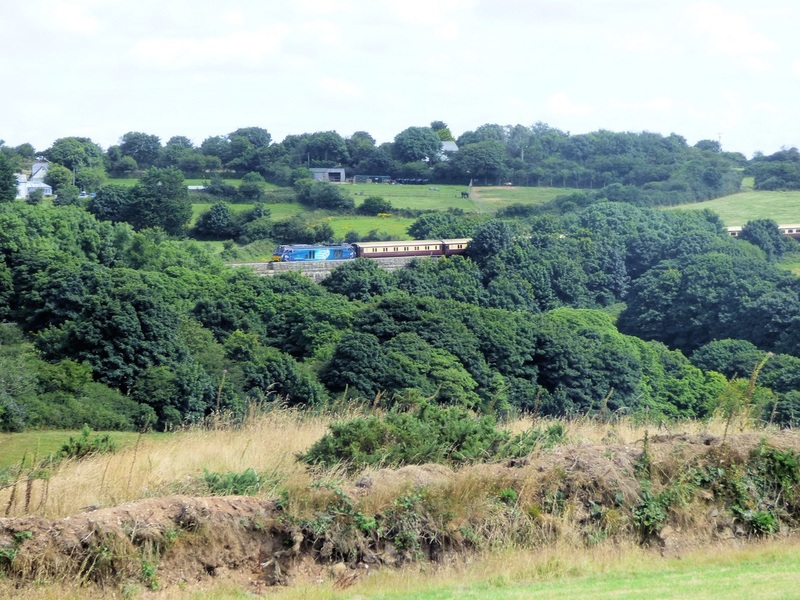 A short dead-end siding, facing for up trains was there in 1866, but in view of Hallenbeagle’s decline, it was most probably used for general freight traffic for Scorrier and perhaps coal for Wheal Rose. 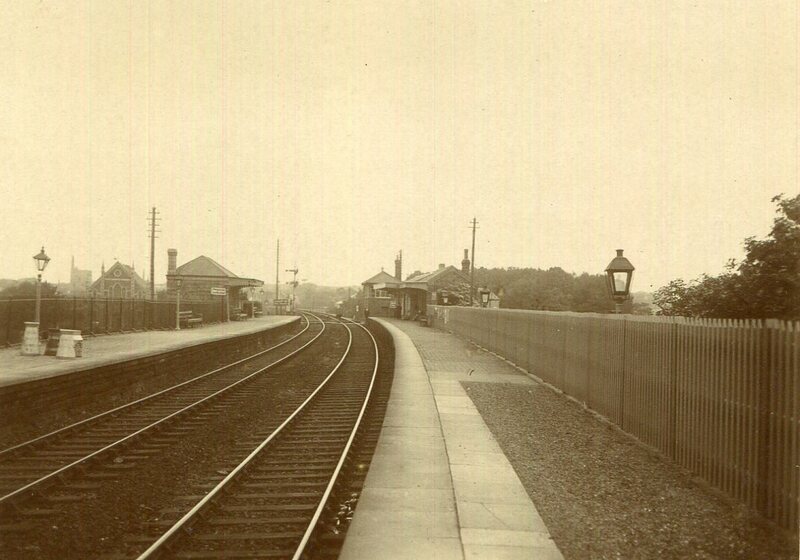 There were no sidings at Scorrier station at this time, with the single line (mixed gauge from 1866) on a high embankment. 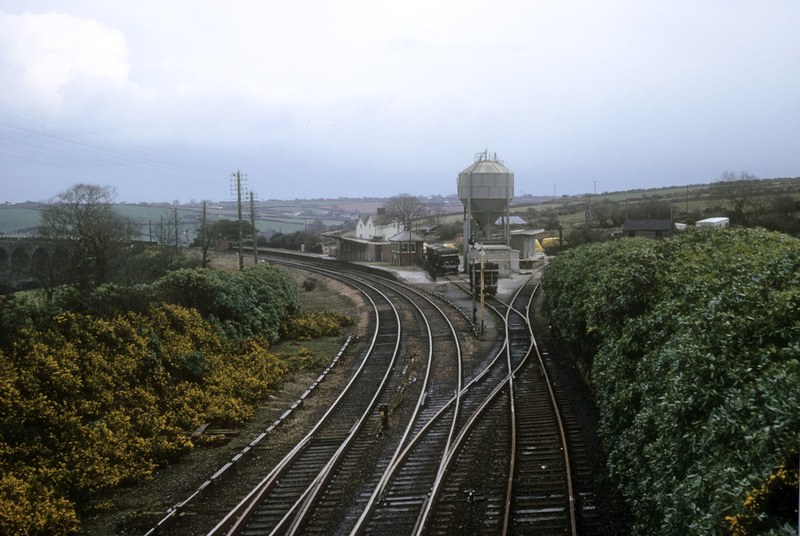 The railway from Chacewater to Scorrier was doubled in 1900 and two signal boxes opened at Scorrier: Wheal Busy Siding (at the Hallenbeagle site) and Scorrier Station. 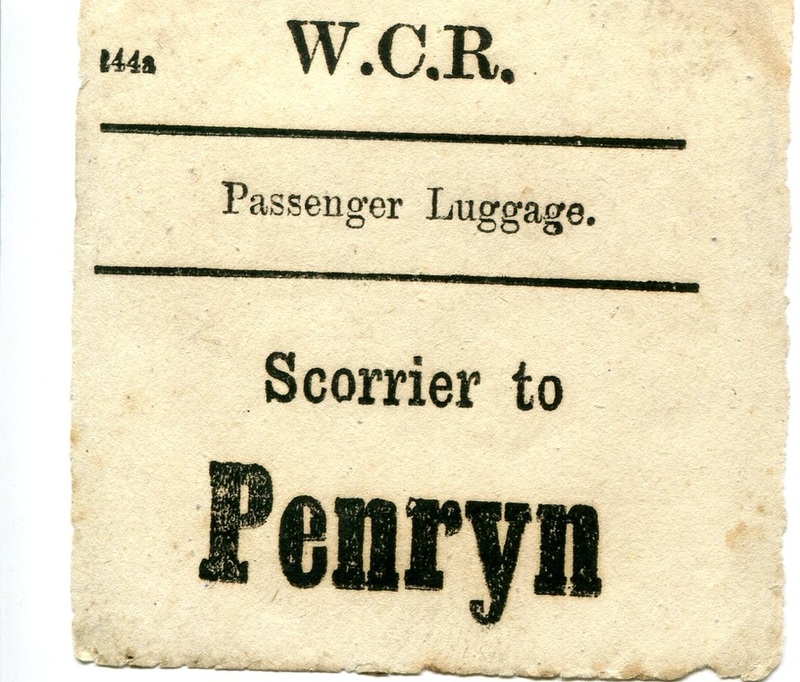 Scorrier box issued the train staffs for the single line to Redruth. 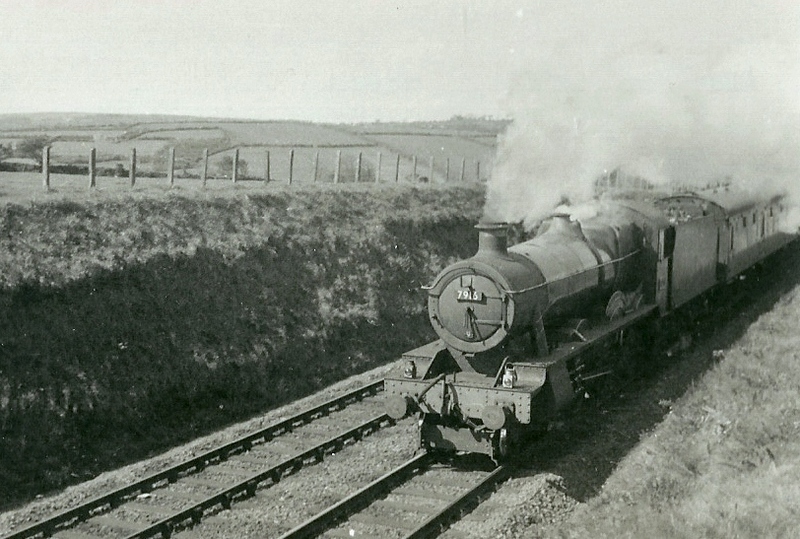 Wheal Busy Siding in 1900 was a simple loop, connected to the up main at the Truro end and the down main at the Redruth end. 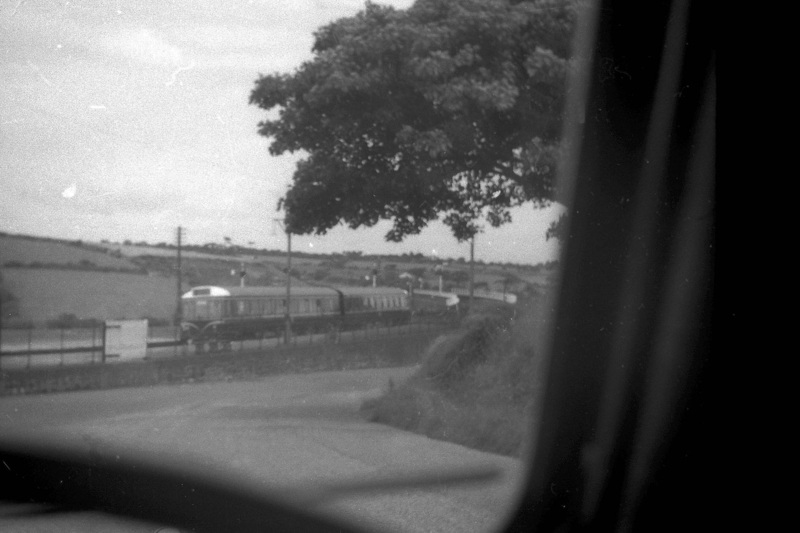 There was a level crossing. 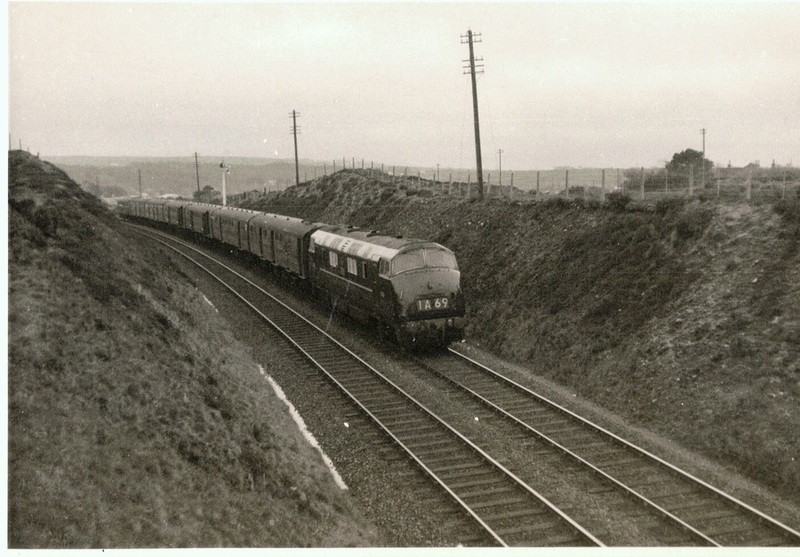 The line between Scorrier and Drump Lane was finally doubled in 1930 and this resulted in changes at Wheal Busy: Scorrier box closed and its down refuge siding (stretching back to Wheal Busy) was connected to Wheal Busy box to form a down goods loop. A new, larger lever frame was installed to control the new layout. 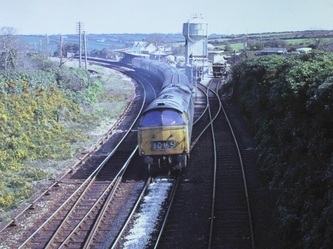 Wheal Busy officially closed to public freight traffic in 1963, though nothing had arrived or departed for some years before that: BR was simply closing the books. 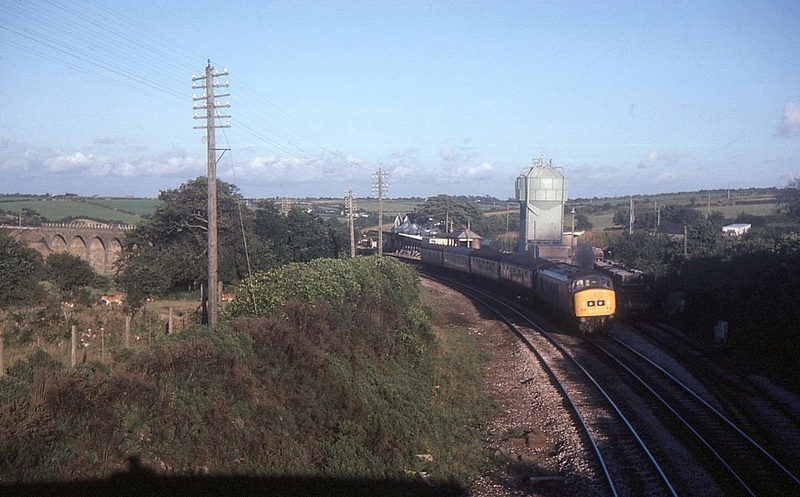 Two of the three siding connections to the main line were lifted in 1962 and Wheal Busy box, by now a ‘morning turn only’ box, finally closed a week after the ‘Cornubian’ passed by –the end of two eras. 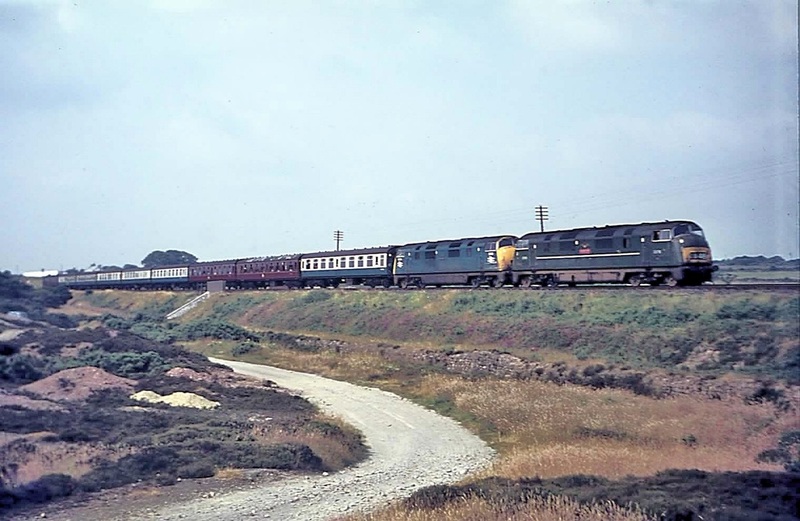 Many thanks to Roy Hart for this very detailed information. Wheal Busy was designated a Class 4 box. 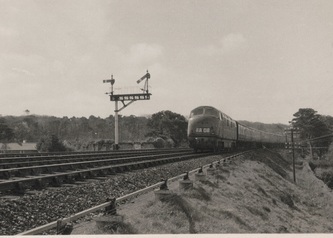 As well as the usual main line running signals there was a rarely used crossover and a lead to the siding on the down side. 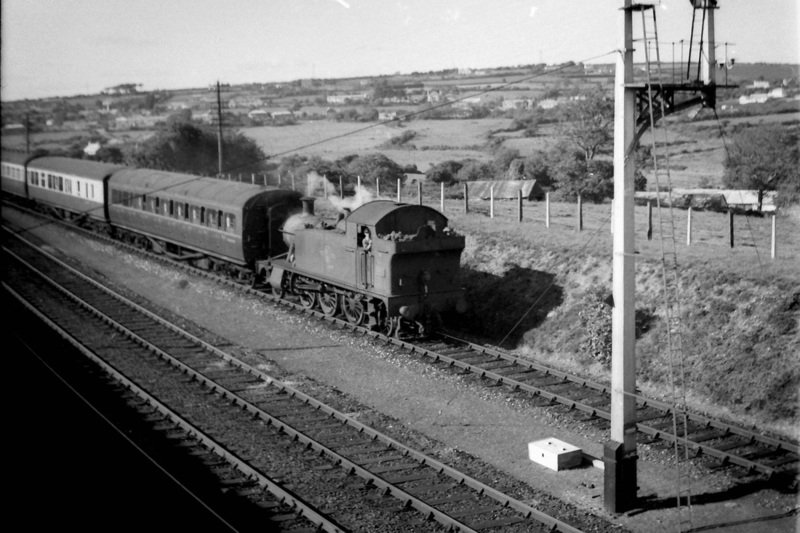 Inside the box was a small coal burning stovewith an oven on top and two paraffin lamps for lighting. On the right at the top of the steps was a small chemical toilet which had to be emptied the best way possible (i.e. Down the railway bank). 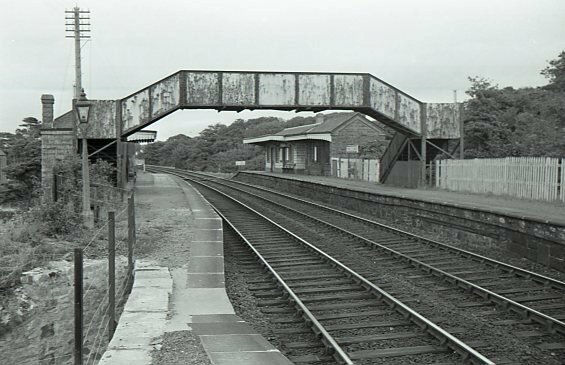 Adjacent was a vehicular level crossing whose gates were operated by the public after consultation with the signalman. There was also a set of pedestrian wicket gates. The box had a switch to enable the box to be switched out of circuit at the end of the shift at around 7 – 8 pm when the main line signals were left in the off position. 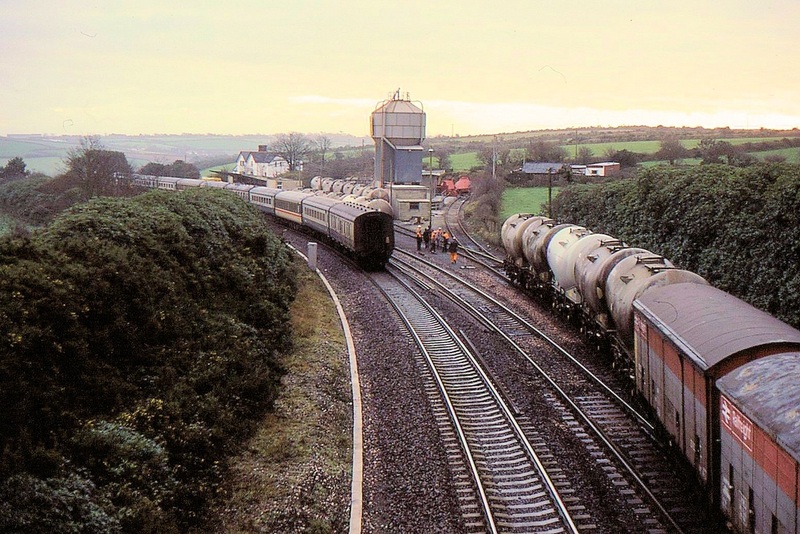 Early shift began at 04.15am (3.30am on summer Saturday) to accept early milk, parcel and passenger trains from Truro West and shorten the section to keep traffic moving. 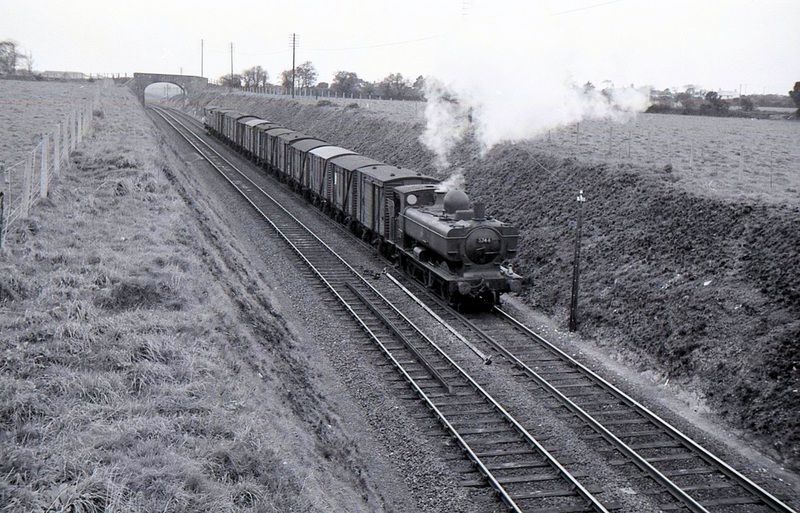 Despite its name the siding was not always very ‘busy’, traffic consisting of occasional trucks of coal and cement supplies for the builders merchants. 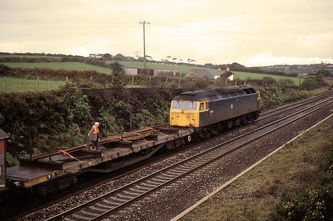 Wagons were delivered by the local goods from Truro. The siding passed into history in 1963 and the box itself closed the following year. Today some traces still remain and there is still (Sept 2009) a right of way across the tracks at this site. 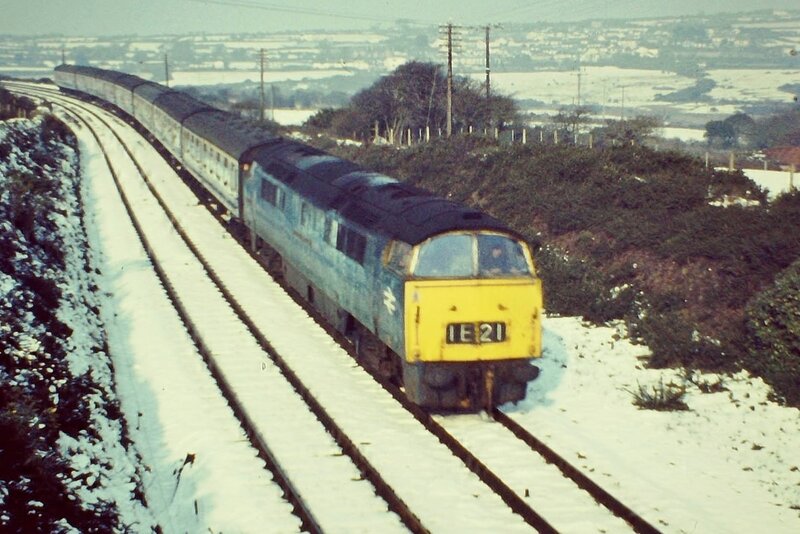 In these days of cancelled trains due to staff failing to turn up etc. the following story may be of interest. In June 1960, with the summer timetable in operation I was booked for a rest day on the Saturday. We went to bed on Friday with plans for an outing the next day. However, at about 2am on the Saturday morning there was a loud knock at the front door. I opened the door to find P.C. 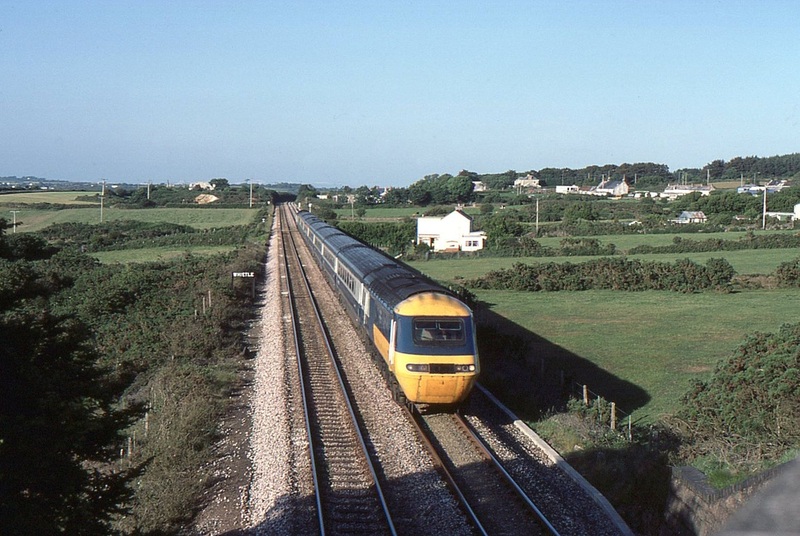 Barrett from Camborne Police s=Station who explained that he had received a telephone call from the B.R. 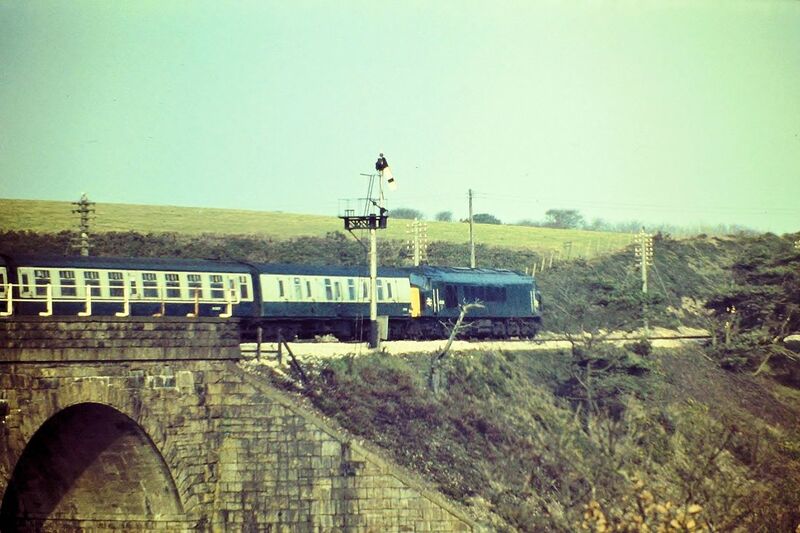 District Inspector at Penzance to say that the early turn signalman at Wheal Busy had fallen off his moped and that I was to go and open the box at 3.30am A few sandwiches were hurriedly made and off I “sped” on my Excelsior 2 stroke motorbike. 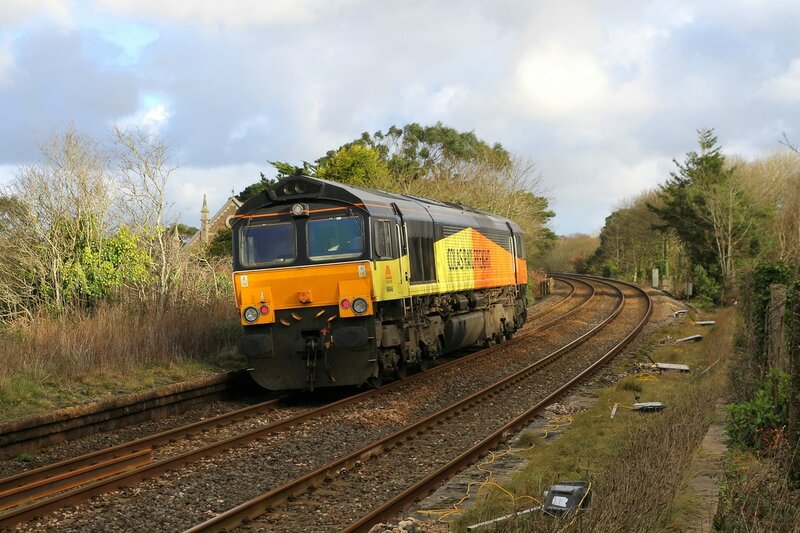 When I reached the end of Sawmills Lane at Scorrier I was surprised to see a glimmer of light in the signal box. 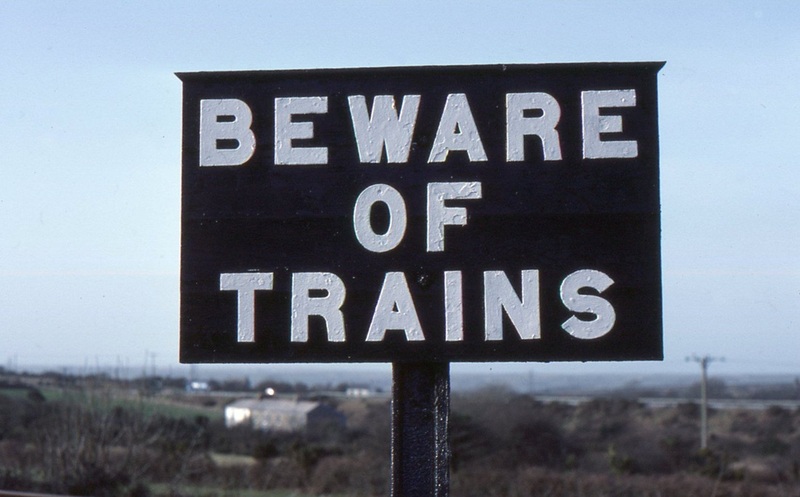 I climbed the stairs, opened the door and found the regular signalman lying in the chair, dazed and half asleep with blood all over his face. 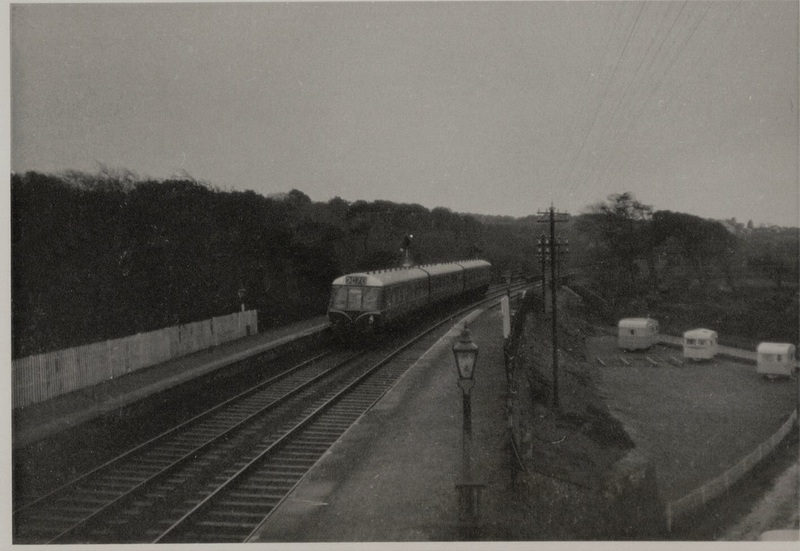 His story was that he had visited the Railway club in Truro on Friday evening and, rather worse for wear, decided to make his way to the box to sleep so as not to be late in the morning. Unfortunately, he fell off his moped in Highertown and was taken to the Casualty Department at Truro Hospital where he was patched up and told to go home. 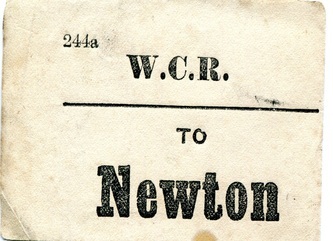 The hospital informed the railway of the situation. However, instead of going home he returned to Highertown, recovered his moped and road to the box to catch up on some sleep. He wanted to work the shift, but as he was not in a fit state to do so I offered to phone for a taxi to take him home. 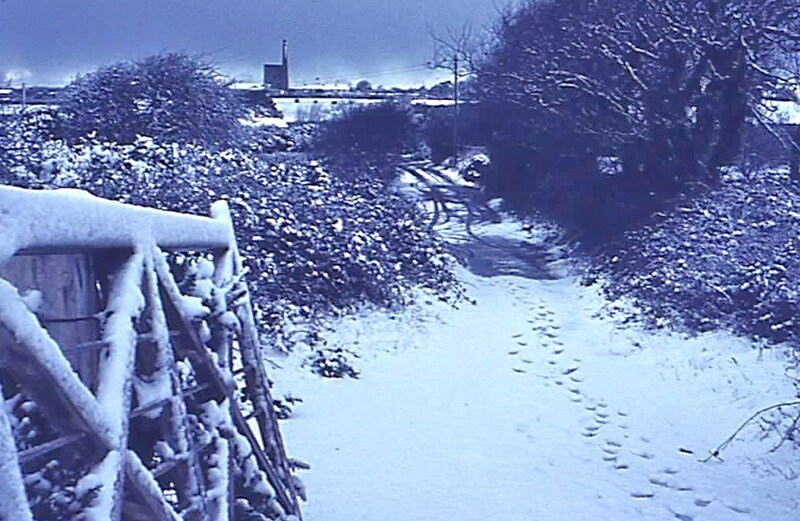 He refused and went out in the lane to search for his moped for the second time that night and eventually made it back to Truro. 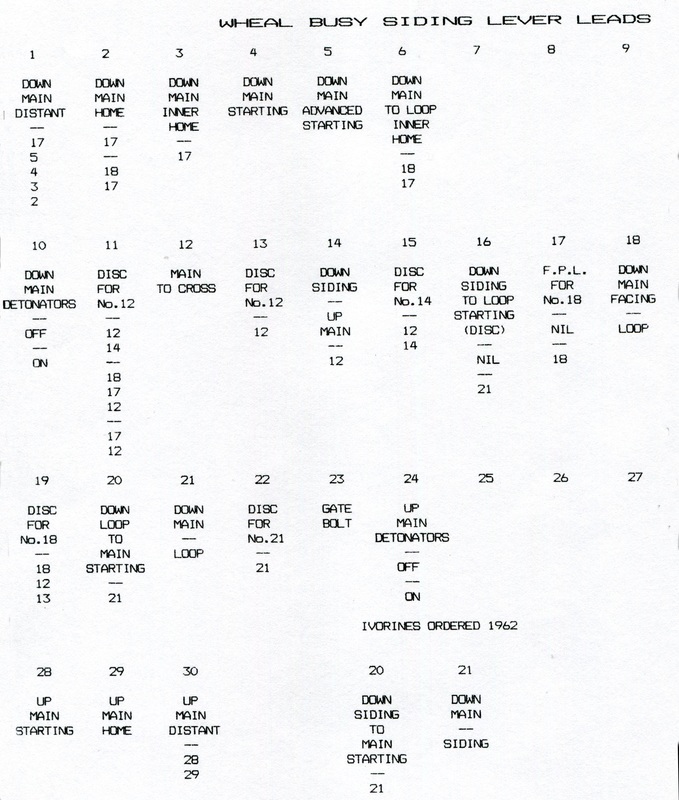 Wheal Busy Siding signal box diagram. 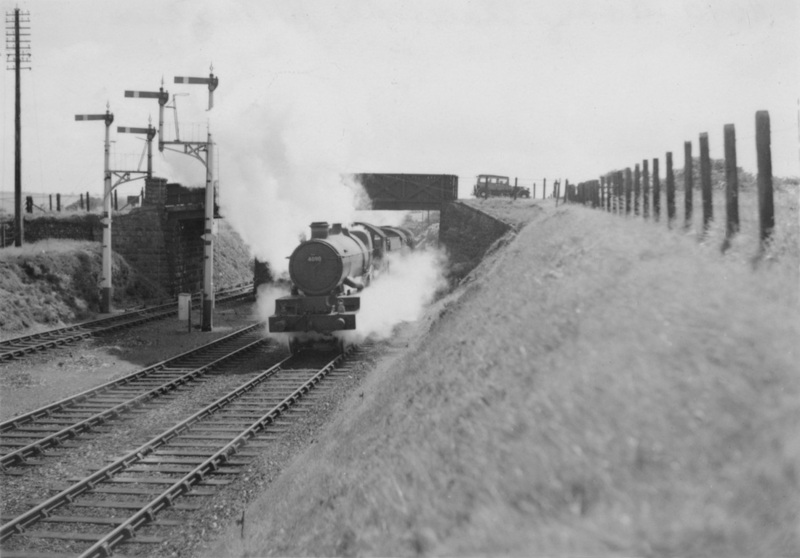 This is the copyright of, and by courtesy of, the Signalling Record Society. 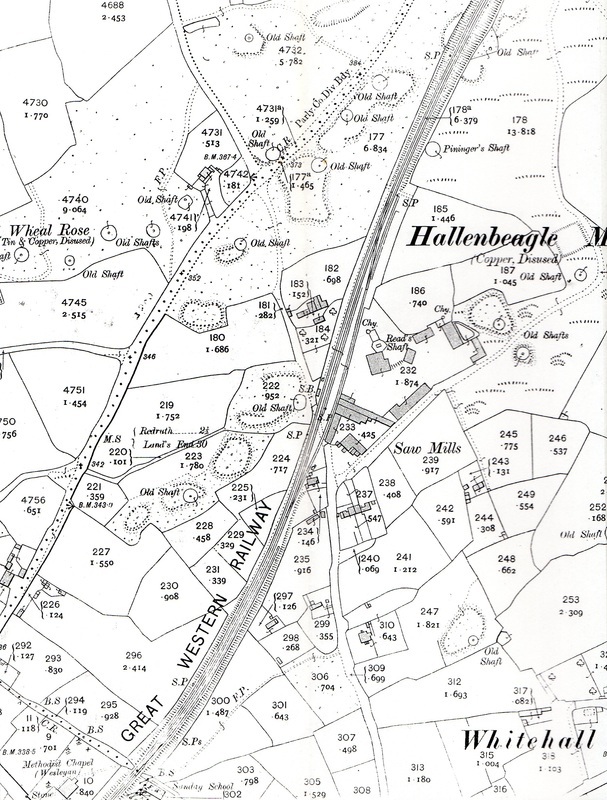 A 1907 OS map of the Wheal Busy area showing the loop and siding serving the mine area. 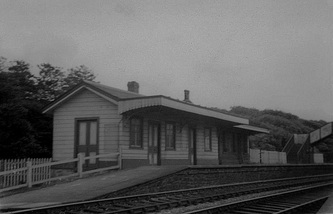 This arrangement was changed later with the siding extended to make it in effect a double loop. 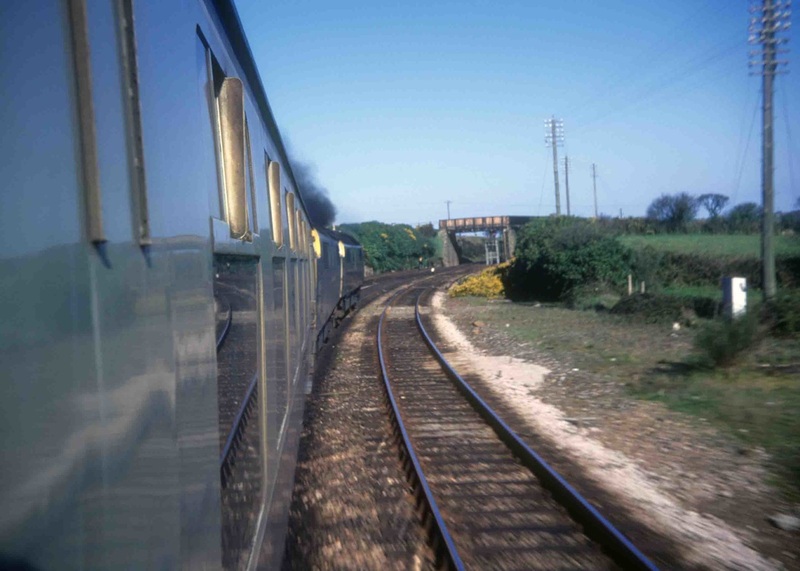 In GWR boxes with interior staircases, then usually these were parallel to an end wall. For that reason the door was in one corner, to give the maximum length of run up to the operating floor, but even then there was usually a part-way landing and a bend near the top. With a door mid-position as per the photo, no way of getting a staircase all the way up! 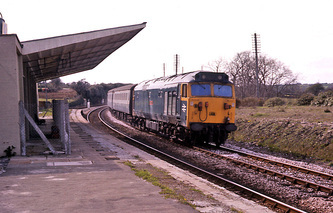 It seems to have been GWR practice, particularly with boxes built ‘on the ground’ rather than on platforms, to put the entrance/steps at the end nearest to approaching trains. 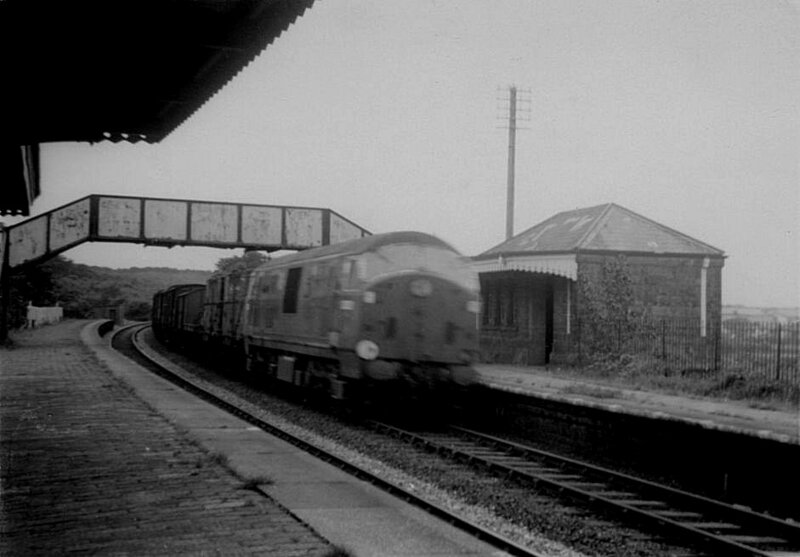 This was a safety precaution, so that any signalman coming out of his box could see any train approaching. 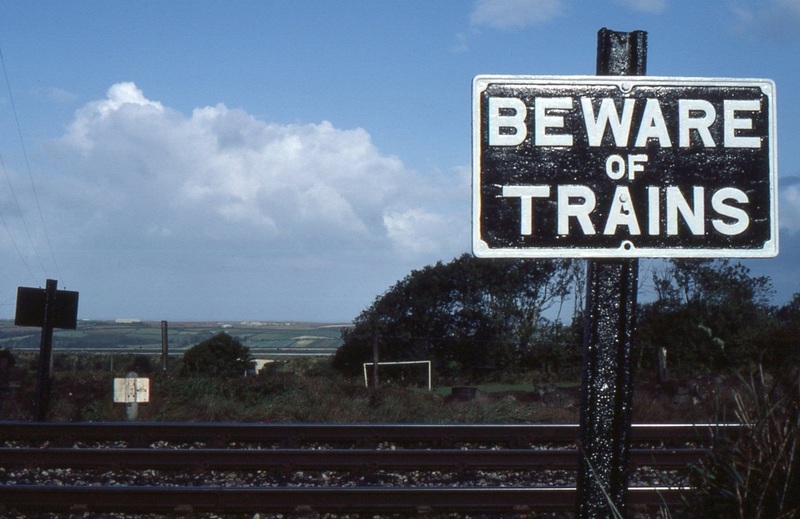 In contrast, if he came out the ‘far’ end and turned the corner to walk along in front of the box, there was a risk that he would be taken unawares and hit by a passing train. 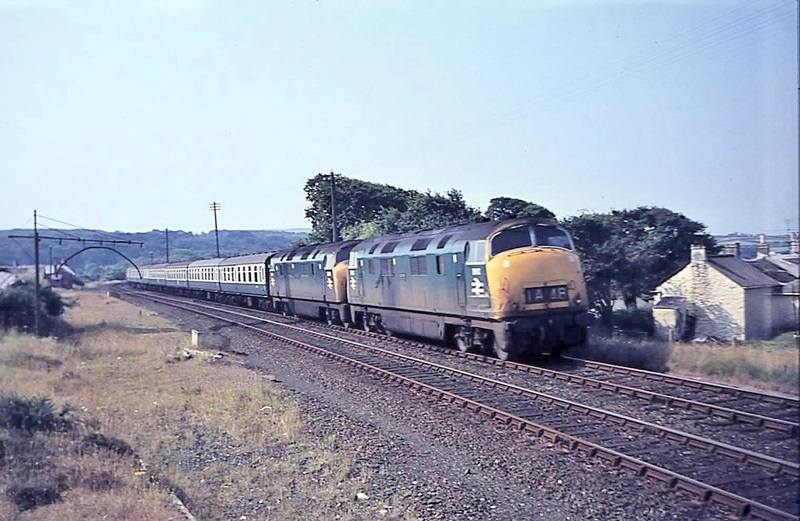 Not so much of a risk with platform boxes, as there was more clearance in front, hence examples such as Blue Anchor or Williton etc. 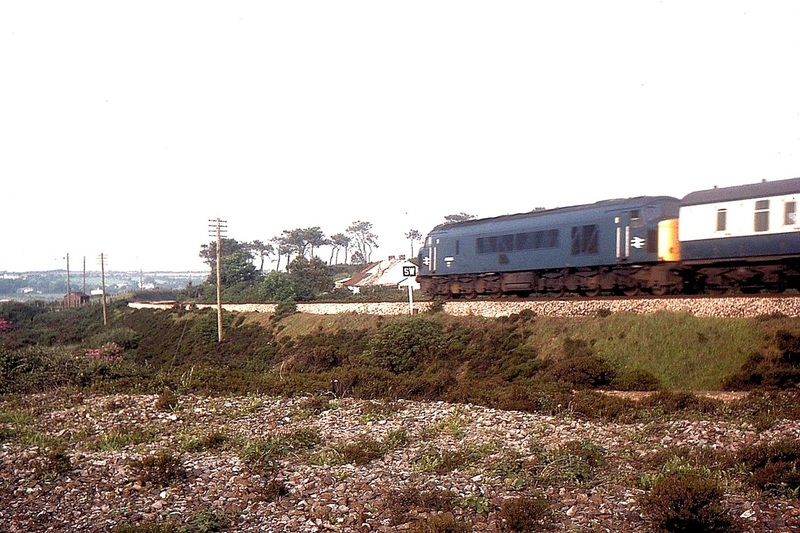 Clearly there were exceptions, as can be seen at Wheal Busy, but if you look carefully then there were at least some guard rails at the far end beside the track near what was probably the bottom of the steps. I would guess that the picture pre-dates 1930, when the lever-frame was extended – any idea? 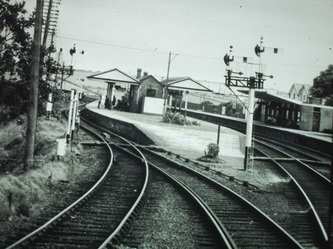 The SRS diagram is for the later period and has the wicket gates on the opposite side of the road than the photo, also the main gate hinged the opposite way. 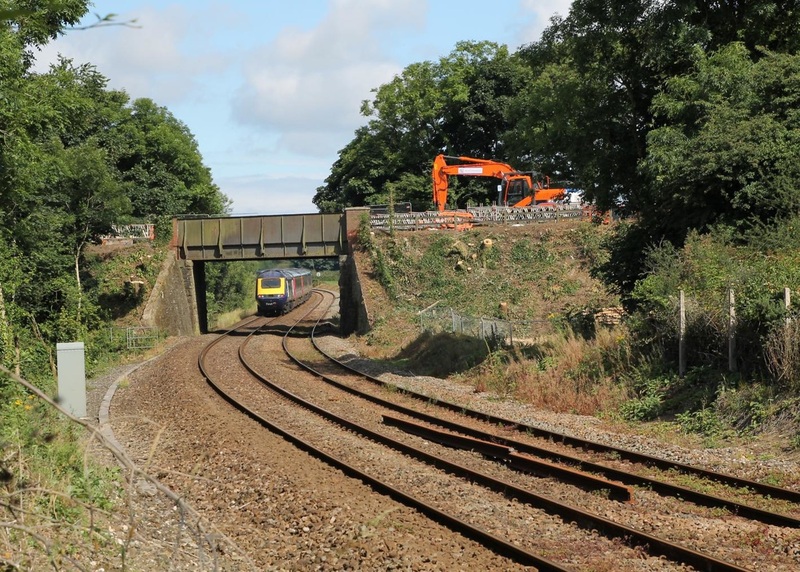 These may have been changed at some time, tho’ its not unknown for SB drawings to be wrong on such matters – the draughtsman simply had info that there were gates, but knew no more than that. 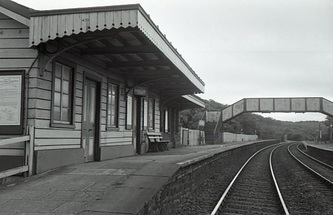 The wicket gates were locked as per GWR practice by a separate 2-lever ‘small’ frame, the handles of which can be seen by the open window. 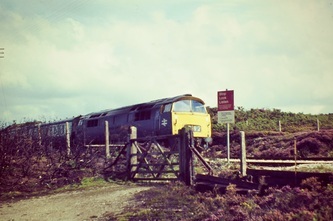 It was usually the requirement that LC road gates closed alternatively across the road or the railway, thereby ‘fencing off’ the railway when the gates were open to road traffic to prevent straying animals etc. That’s why in many cases, where the road was much narrower than the rail crossing, you had gates which overlapped when across the road so as to reach far enough across the railway. 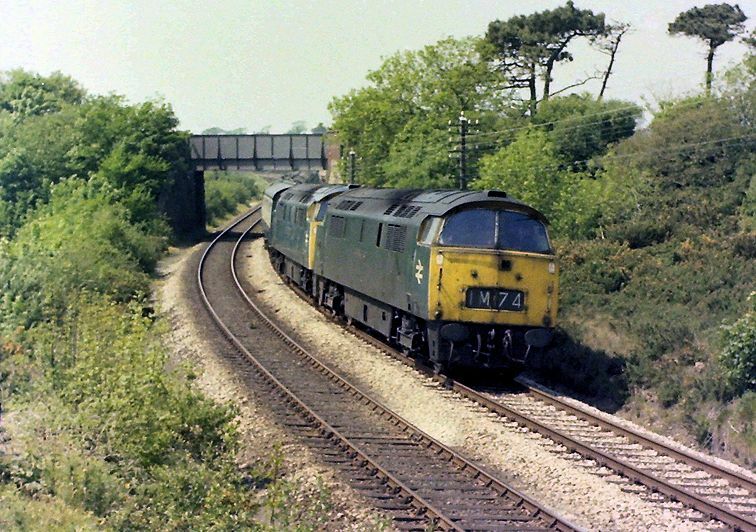 But that did not seem to be universal, as is evident from this picture, the gates at Williton and various other ‘minor’ roads. Dating from early days when road traffic was light, it was requirement of the old Rule 99 that gates were to be kept across the road except when required to be open for the passage of road traffic. 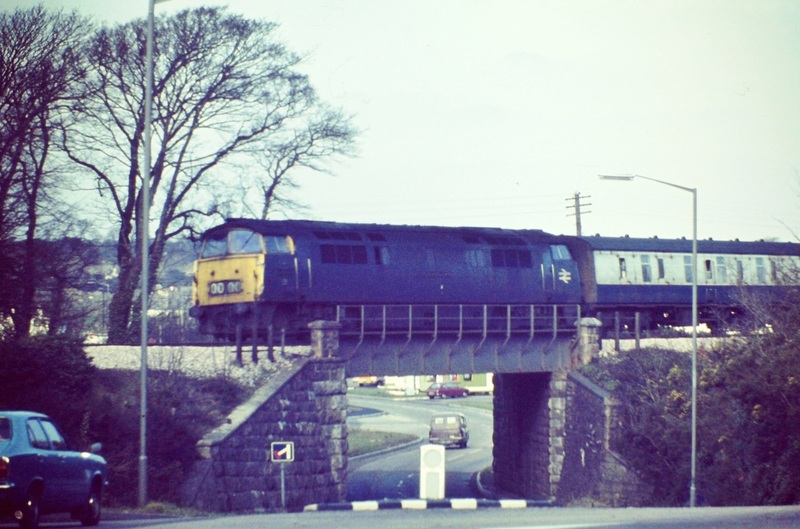 Over the years the emphasis has changed and “most” road crossings with any reasonable level of traffic are now “Rule 99 exempt”. 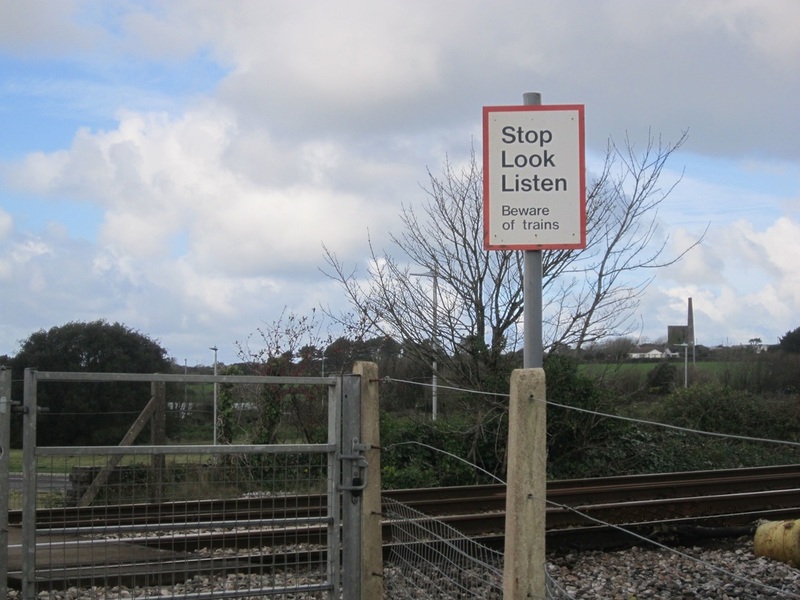 Even so, there are still many minor road crossings, and especially ‘occupation crossings’, where Rule 99 still applies and road users have to ask the crossing-keeper for the gates to be opened. 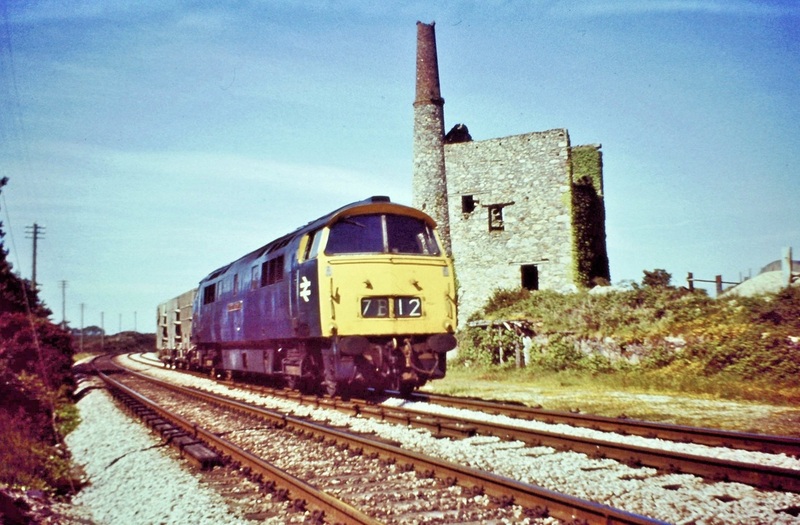 That may well have been the situation at Wheal Busy. 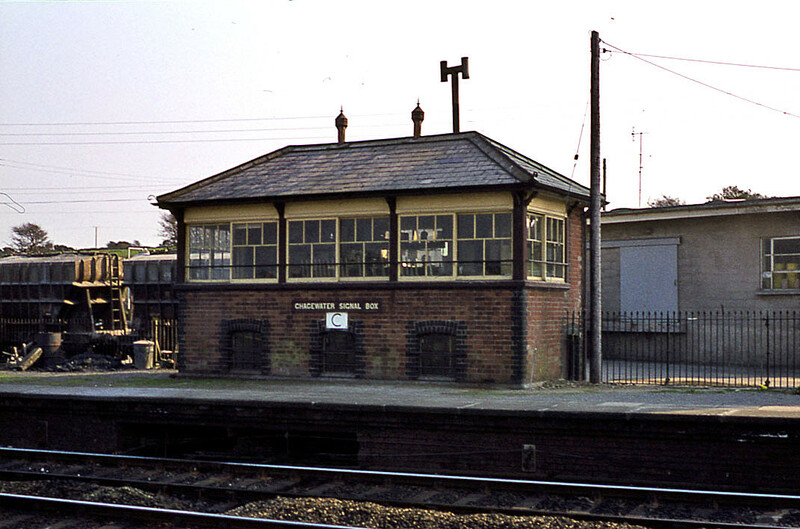 There is a distinction to make between a signal-box being simply ‘switched out’ and actually unmanned. 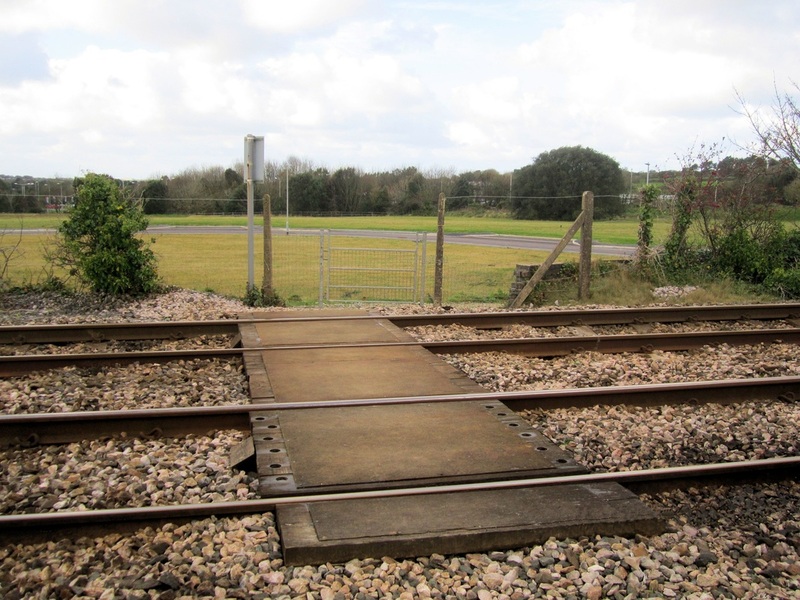 It was quite common at SBs which controlled level-crossings, but not much else, to find them ‘switched out’ at periods of quiet rail traffic – ie they ceased to operate as a block-post – but still manned as a ‘crossing box’. This was an economy measure, as a crossing-keeper got paid less than a signalman, even if in fact it was the same chap doing the job! 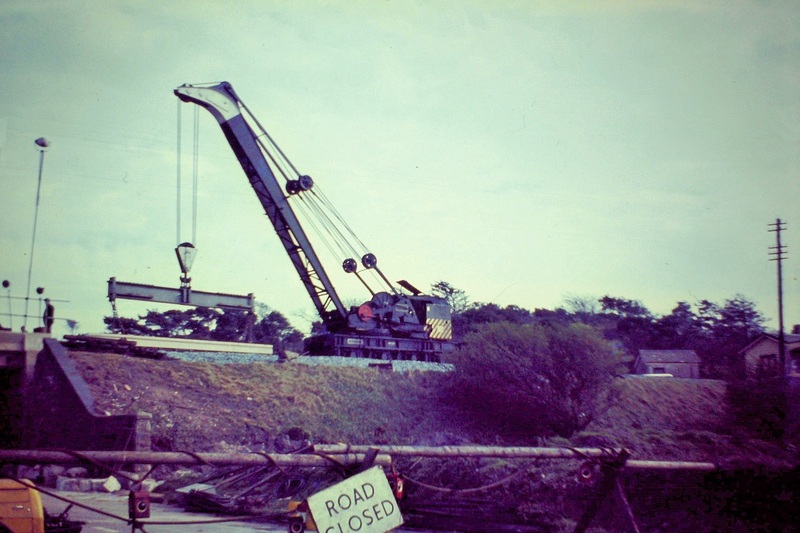 At night on minor roads it might well be the case that the box would be switched-out, the gates bolted across the road, and then the box ‘shut’ and unmanned - the locals would know that the road was closed between specified hours. I would guess however that the wickets were left unlocked in order to facilitate pedestrian passage (wickets rarely being interlocked with the signals). 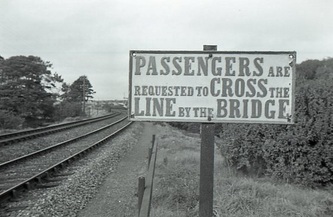 In those days, if someone got knocked down when crossing the line, it would be their own fault for being careless! 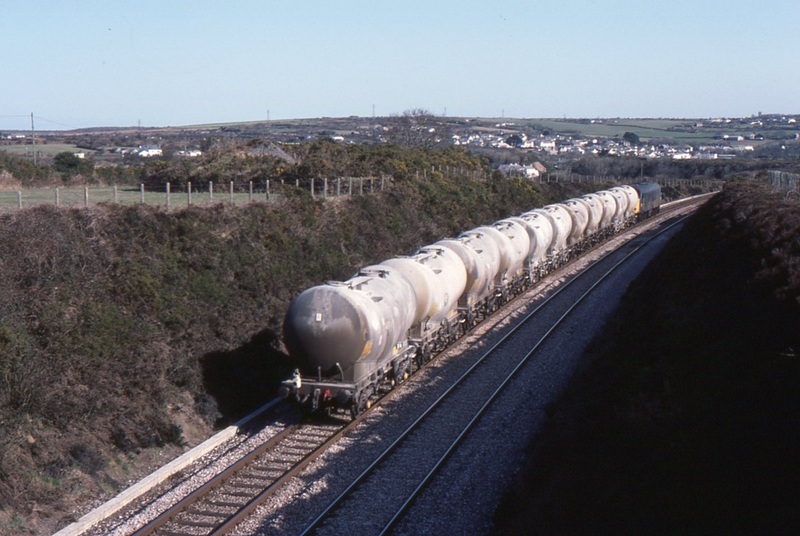 Wheal Busy. 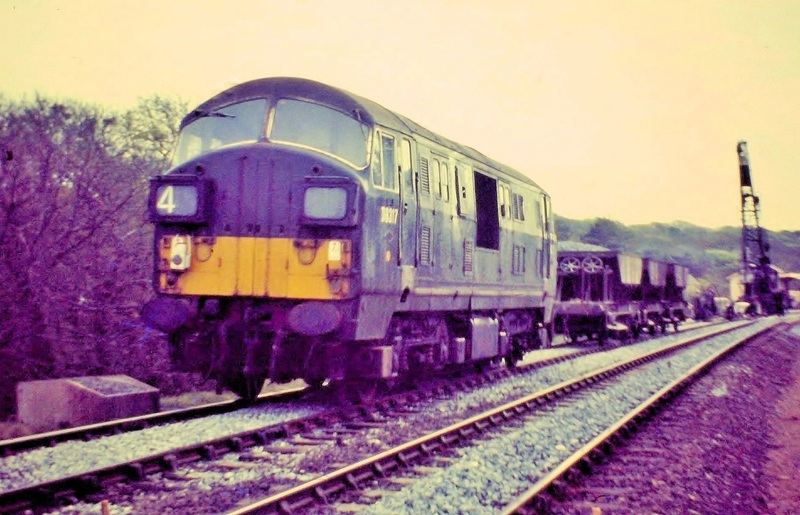 D803 Albion with obvious front end damage leads D804 Avenger. 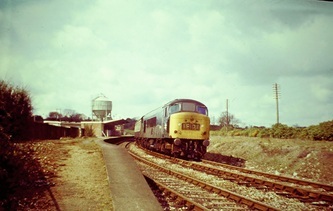 Summer 1968 Copyright Sid Sponheimer For several reasons this view is no longer possible - the loading gauge is long gone, however the cottages seen to the right were demolished in a land reclamation scheme on 22nd November 2013. 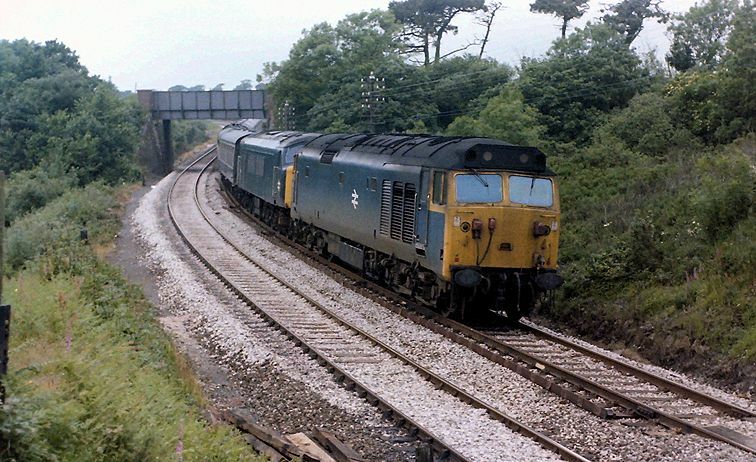 The trees have also vanished as have the telegraph poles and we haven't seen a Warship down this way for many a year. 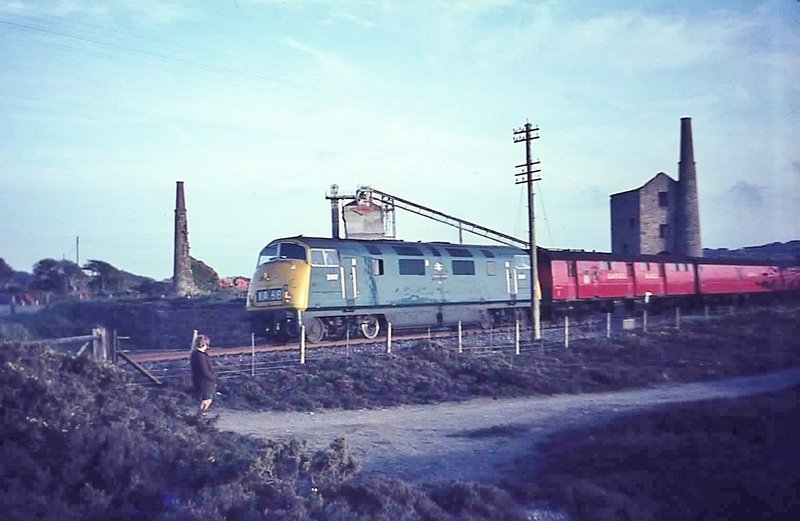 VULCAN AT HALLENBEAGLE Britannia class no 70024 Vulcan of Laira shed thunders past Wheal Busy Siding in about 1953 with the up ‘Limited’. 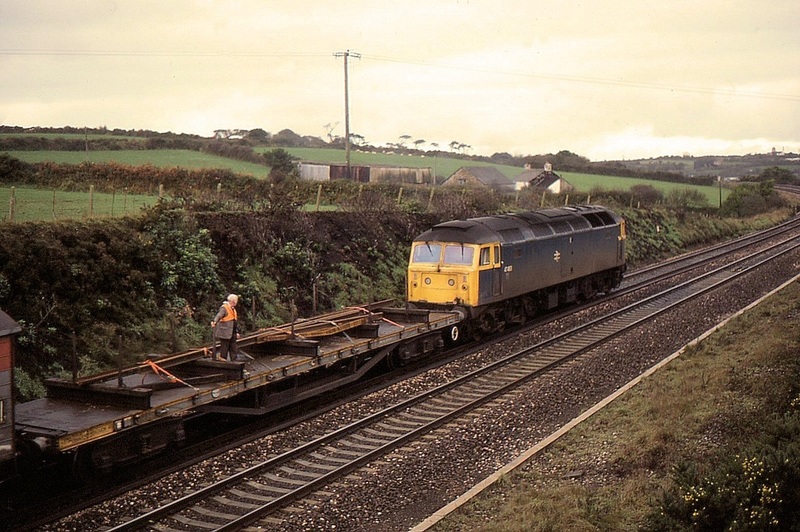 She is piloted by a ‘Manor’ (GW convention was to place the train engine ahead of the pilot). 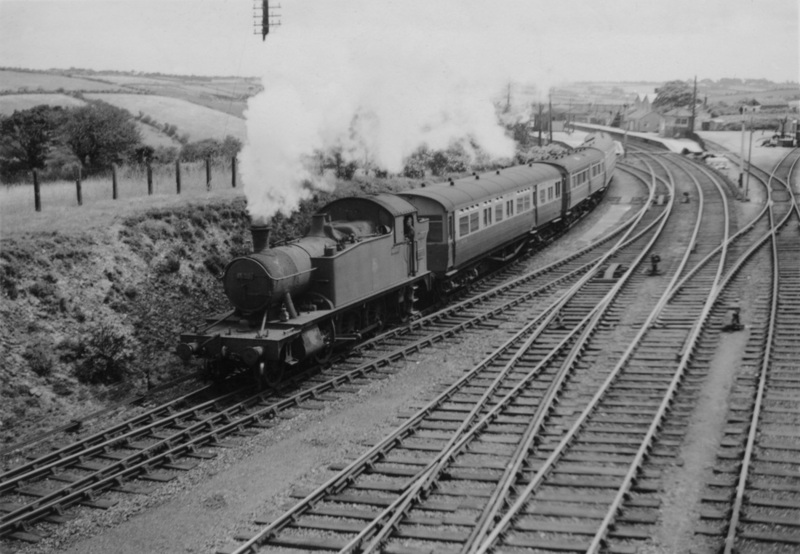 The Western Region’s quota of Britannias were named after old Broad Gauge engines and defunct members of the ‘Star’ class. 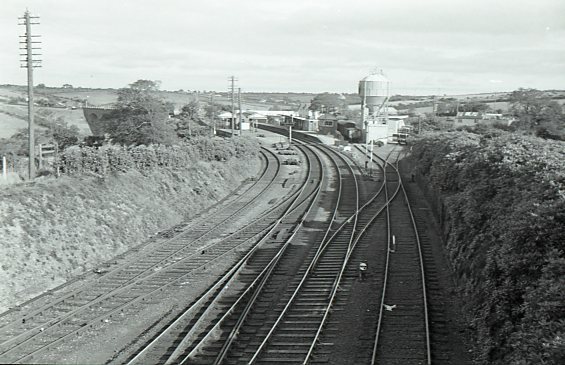 Hallenbeagle engine house is top right-of-centre. 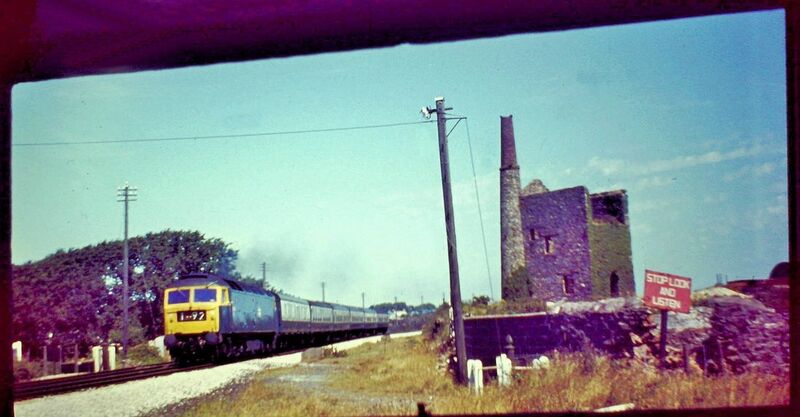 The train has just passed the Wheal Busy up starting signal. 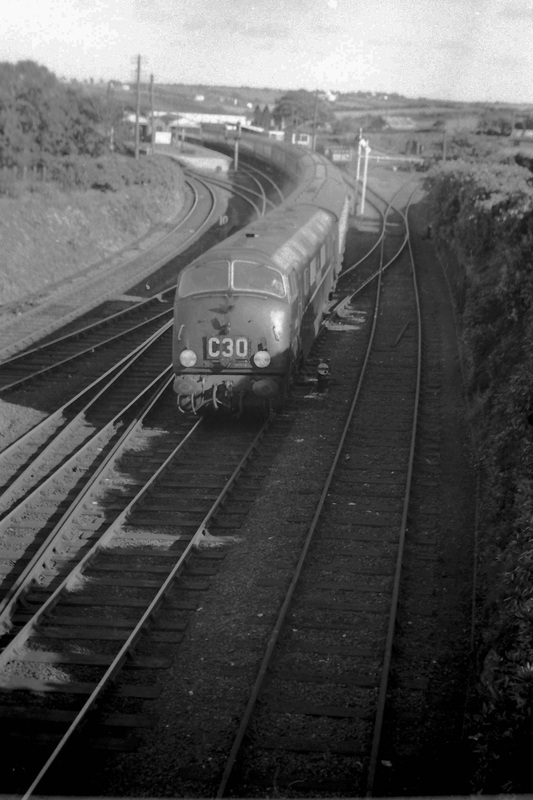 Vulcan came to Laira new at the end of 1951 and left for Cardiff in December 1956. 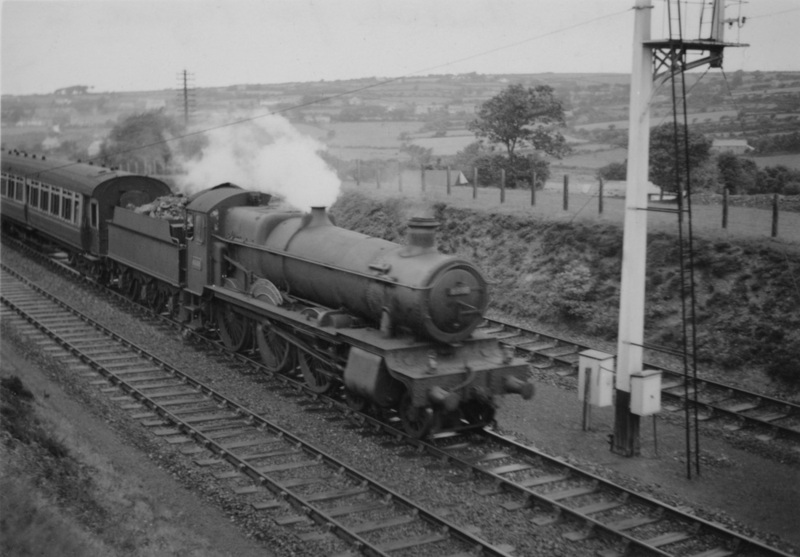 She was loaned to Exmouth Junction shed for a time in 1953 when some Southern Pacifics were taken out of service with defective axles. 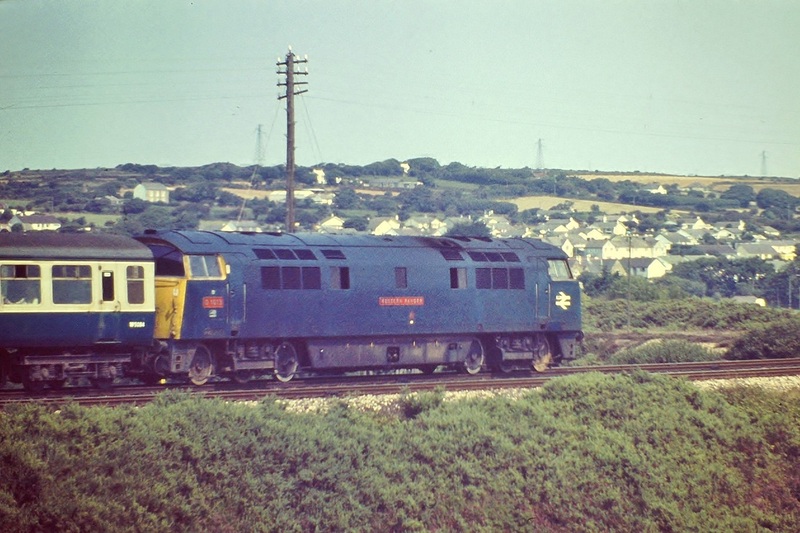 This photograph (copyright Roy Hart) was taken by the late Harry Mitchell of Redruth. This is the summit of the line at 'Apex' in the distance can be seen the familiar outline of Hallenbeagle Enginehouse. The ground to the right of this picture has been completely swept away and the A30 parallels the railway at this point. 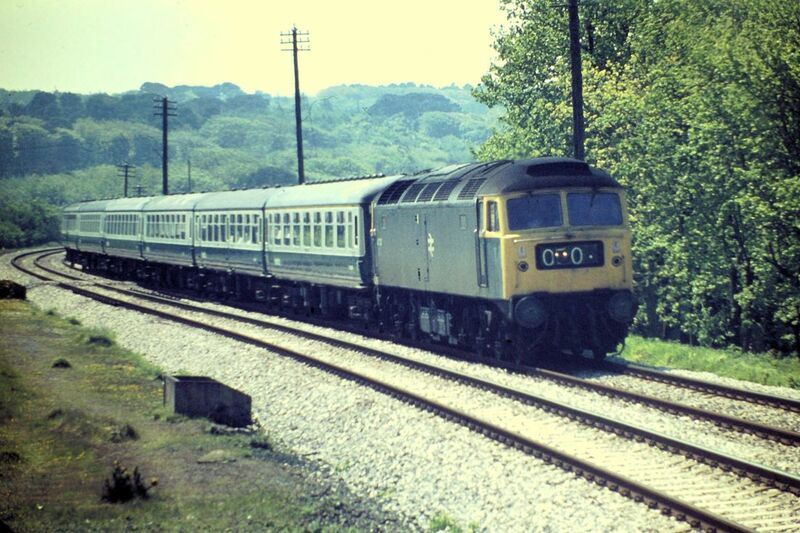 50048 Dauntless powers up the bank towards the summit leaving behind the earth works of the embankment which once carried an access from the west to the Chacewater - Newquay branch . This junction at Blackwater West was part of a triangular junction with the main line at this location. 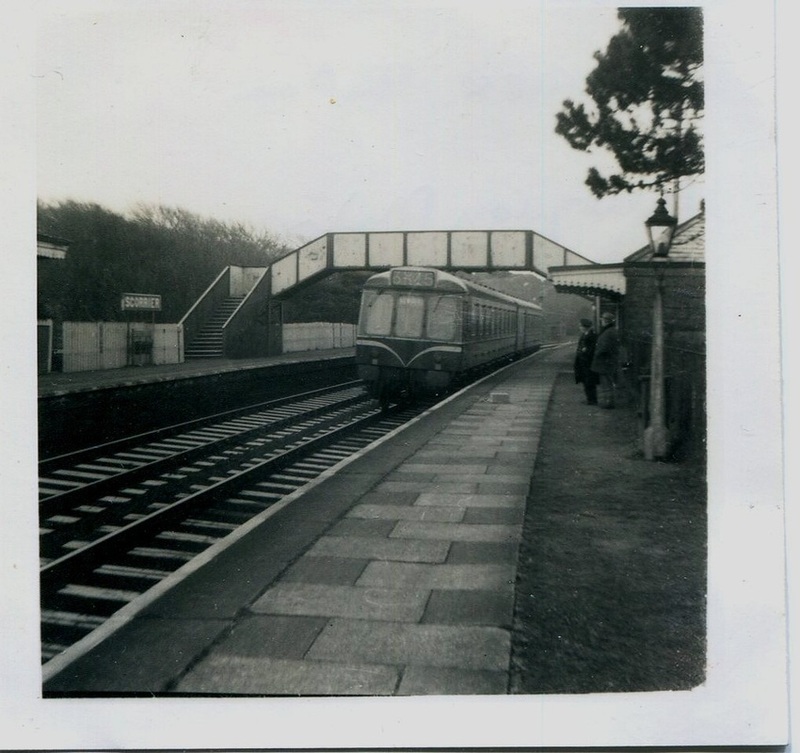 The West curve closed w.e.f May 1919 when the branch was exteded down to Chacewater station. 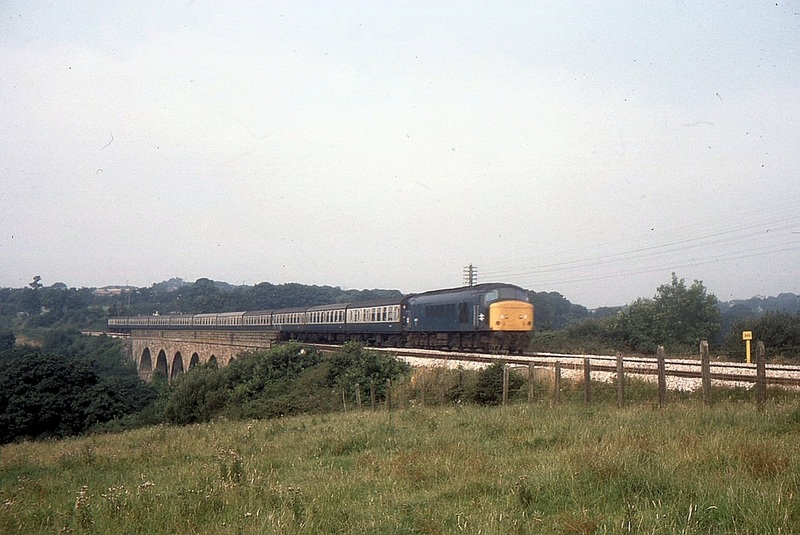 The date of this pictures is 26th September 1976 Copyright Sid Sponheimer. 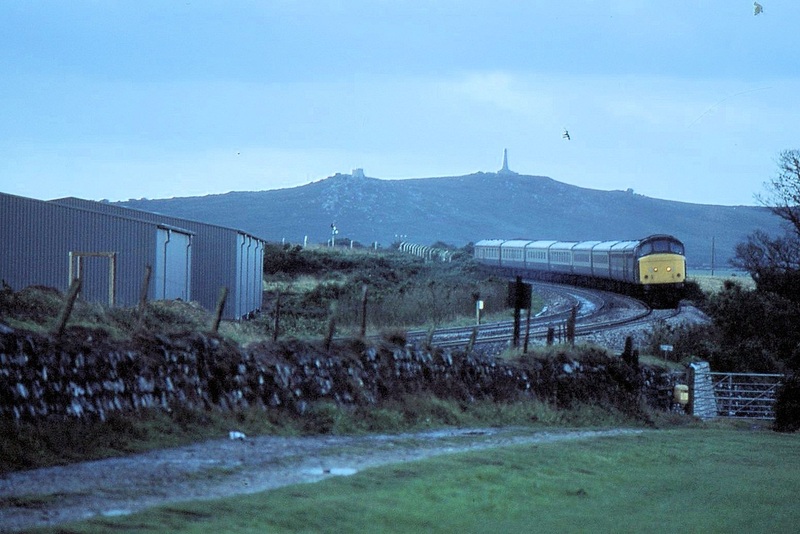 In the distance can be seen Mithian Church tower, whilst breasting the hill can be seen the 'old A30'. 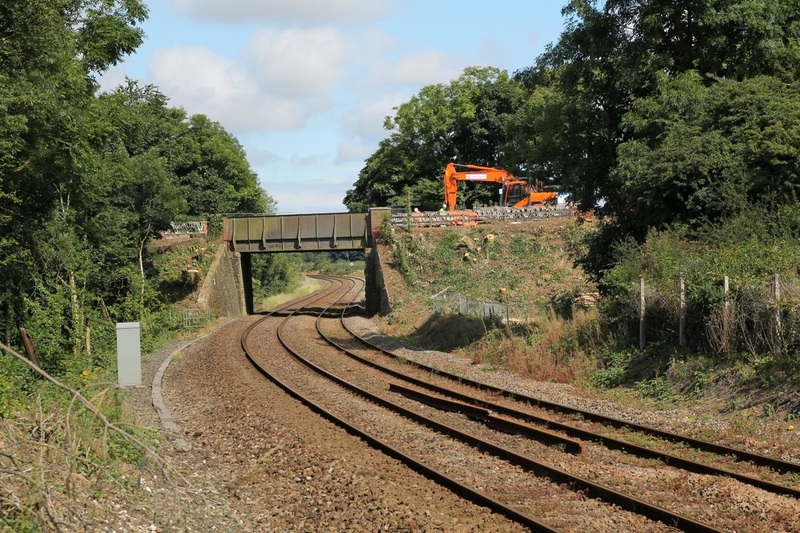 Recently the A30 has been upgraded to be a dual carriagway which runs tight up to the track at this point, the left hand side of the cutting having been completely removed. 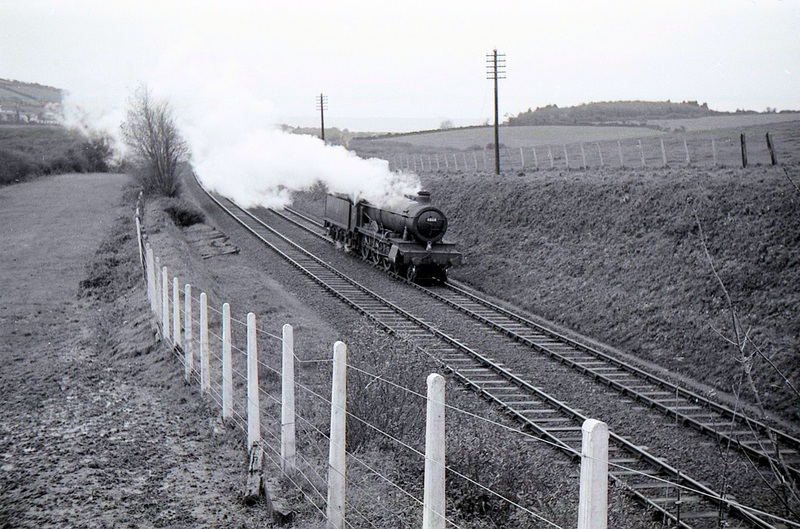 The new road passes through the formation of the old west curve. 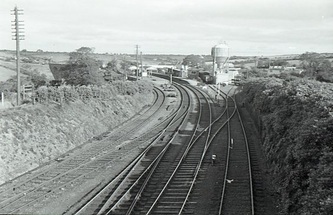 Close by the site of the Blackwater triangle, lay, looking east, on the right, some mine workings which formed a handy vantage point for passing trains used by Sid Sponheimer. Mr. Tony Clark was approached and has very kindly furnished the following information concerning Boscawen Mine. 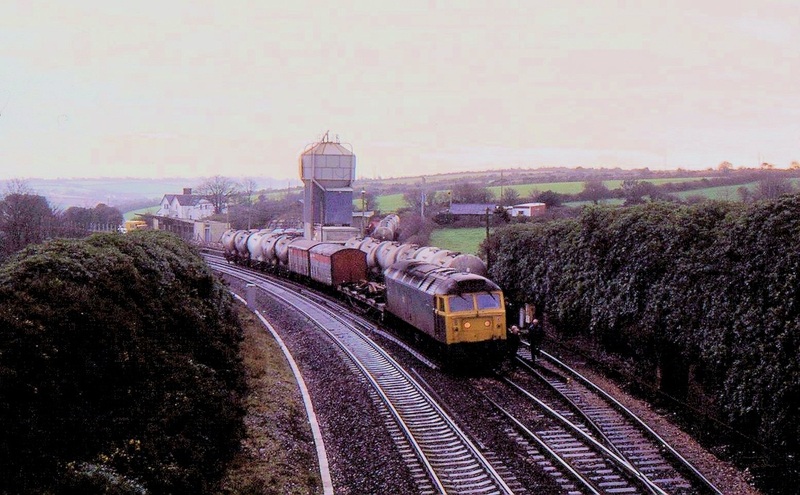 The Blackwater Junctions. Map from the 25" OS map of C1900 courtesy of the National Library of Scotland. 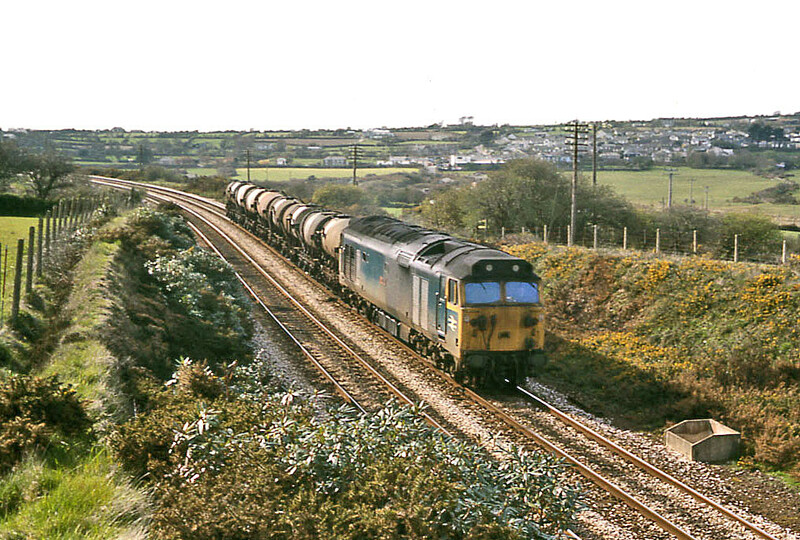 With reference to the map the Cornish main line crosses the map Truro is to the right and Redruth to the left. 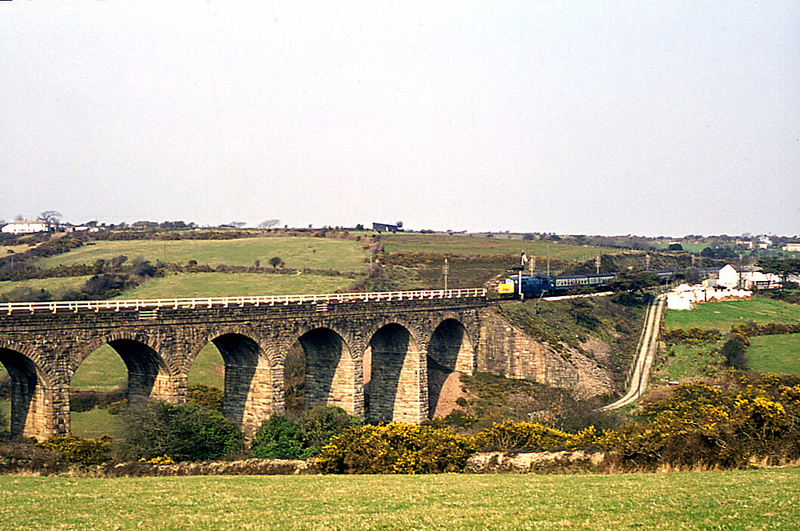 The branch to Newquay passes over the double track bridge over the old A30 which can be seen heading towards Blackwater, right and Scorrier, left. 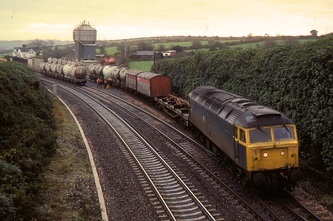 Picture 1 Blackwater North Junction. 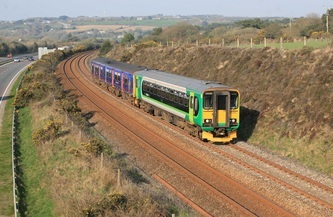 The current main line runs across this picture to the left Truro and to the right Redruth. The parapets of the old A 30 bridge can just be seen bottom left. 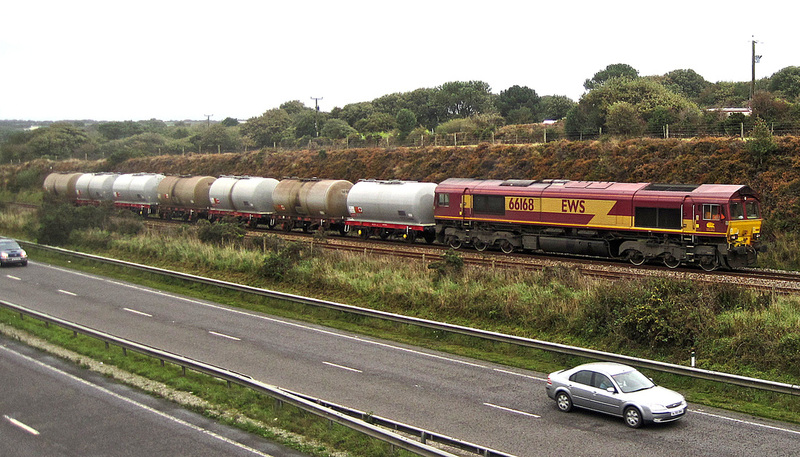 The current A30 dual carriageway cuts across the triangle passing through the embankments. Picture (2A) Looking north across the current main line with the north box at the apex of the triangle. The west box was to the left and the east box just off picture to the right. Source of this picture unknown. Picture (2B). 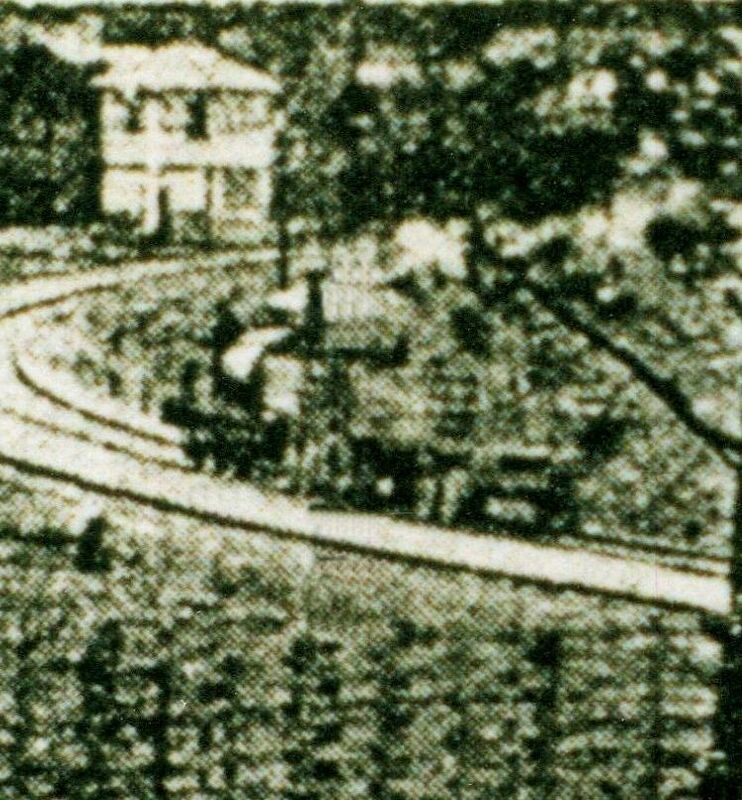 An enlargement of picture (2A) which has been edited - the telephone pole has been removed making the outline of the contractors locomotive and wagon easier to see. Apologies for the quality - the resolution on the original picture is rather limiting. These two pictures show the daily Camborne to Newquay train between Blackwater and Chacewater. 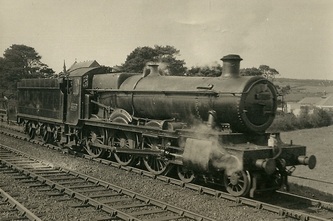 The engine is 4588 – a Truro regular from 1940 until 1959 and after that at Penzance until 1961. She is today in preservation. .N.B. The second picture referred to is several pictures down and is also prefixed 4588. The picture dates from around 1955-6. 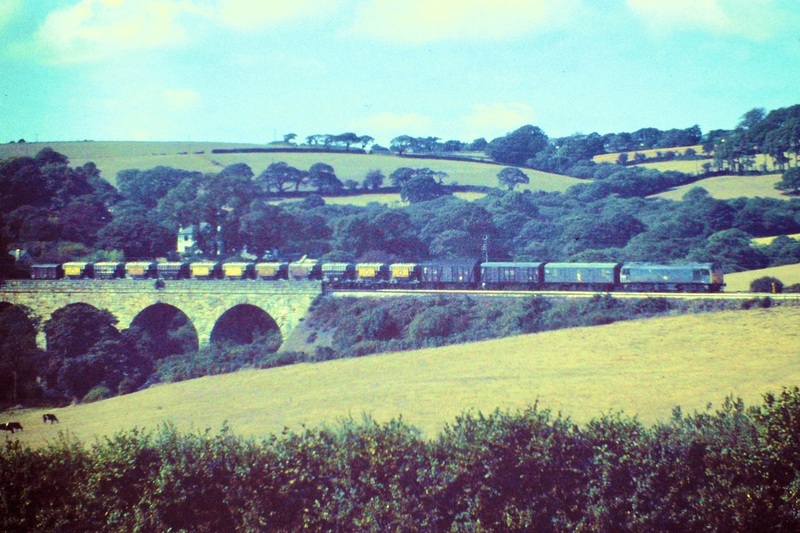 Notice the formation: two auto coaches and two non-corridor coaches. 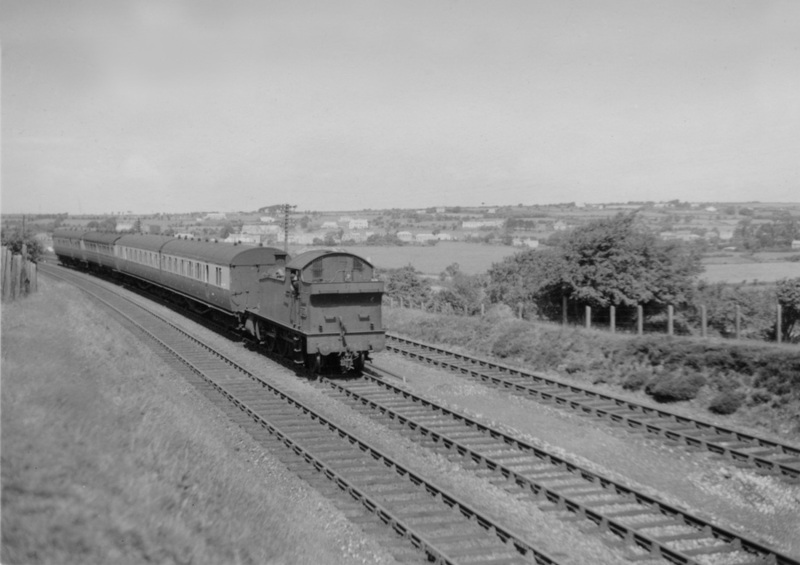 Since the 1920s auto coaches were used on Perranporth branch services to enable access and egress at the seven halts- more than any other Cornish branch line, with their short platforms. 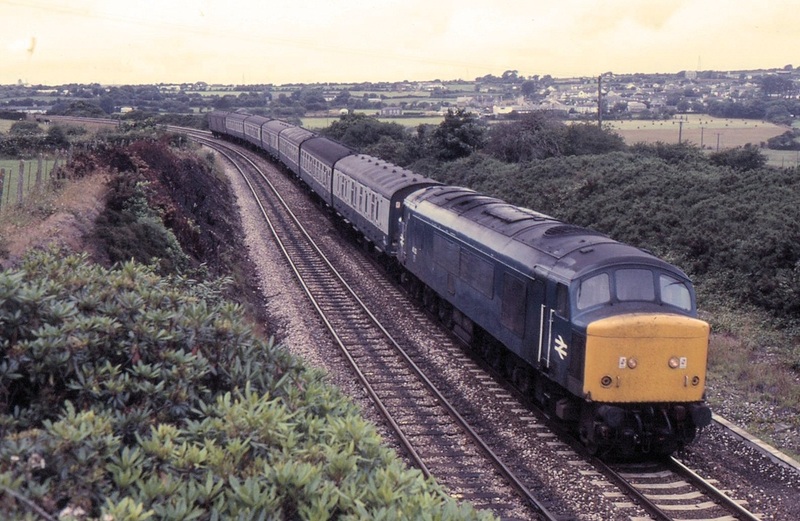 Most other Cornish branches used non-corridor ‘B’ sets, which would not have been suitable here. Until the introduction of DMUs several Newquay/Perranporth services also ran to Falmouth; most published photos of Falmouth trains between the wars show auto cars in the formation and this is why. The auto cars were not used in push-pull mode, but simply for access at the halts and for the guard to issue tickets. 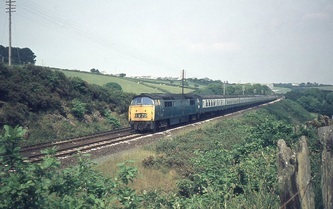 Likewise, main line corridor stock was employed on the Perranporth branch in later years. 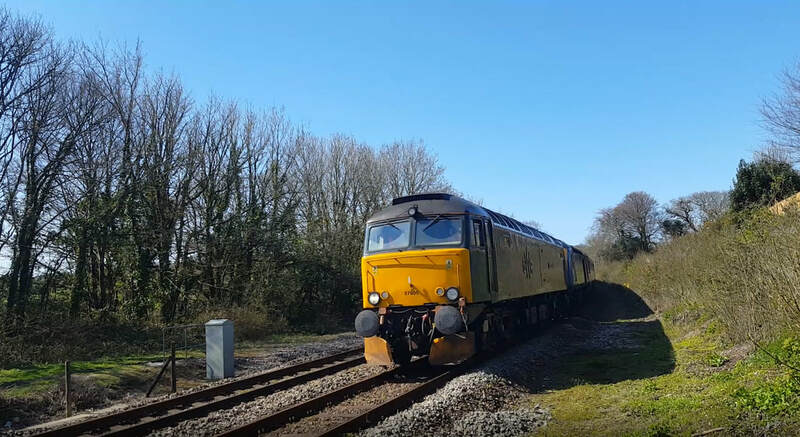 4588 will draw into the bay platform at Chacewater and run around the train. In the second picture, it is heading off on the branch. 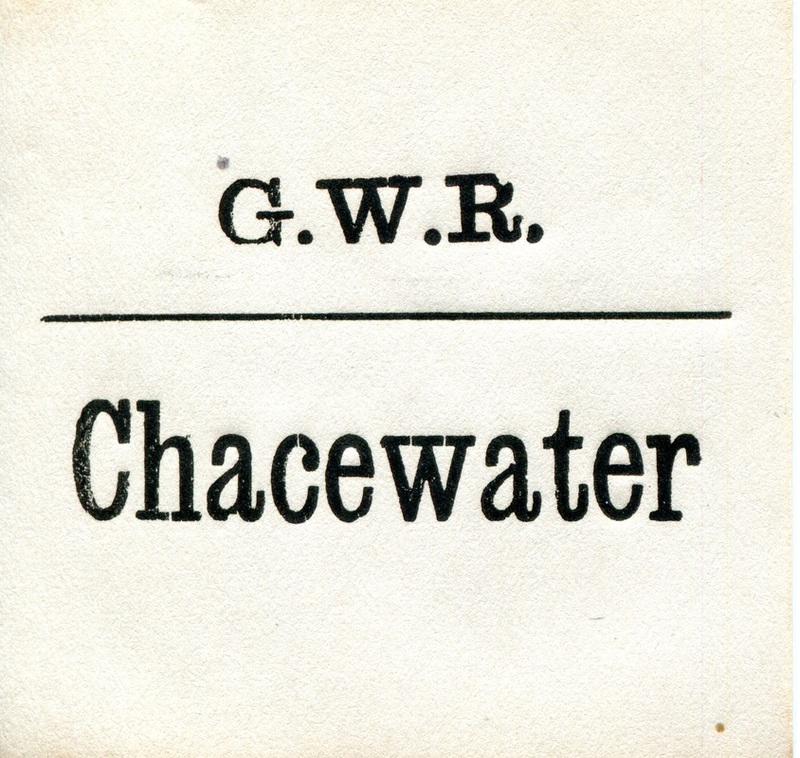 Before the First World War this service would have been a steam railmotor and would have used Blackwater west curve: in 1924 the layout at Chacewater was expanded to facilitate a quick run-around as a substitute for the junctions at Blackwater. 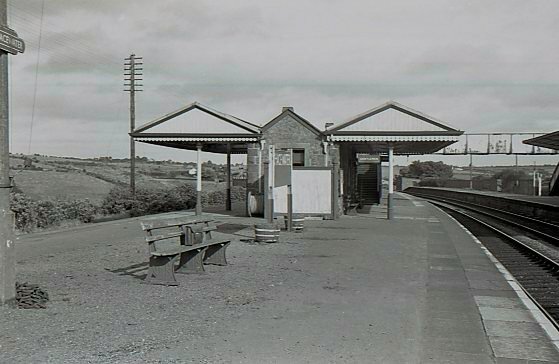 The Chacewater Signal Box that I knew was situated at the western end of the down platform. It was of the usual brick construction with large sliding windows at the front and both ends. 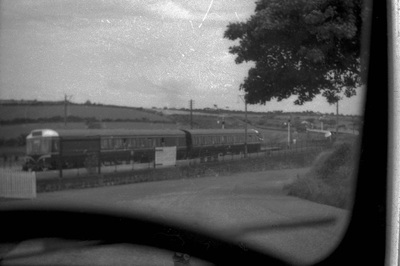 There was also a window at the rear which overlooked the small goods yard. Access steps to the upper floor were inside the box. 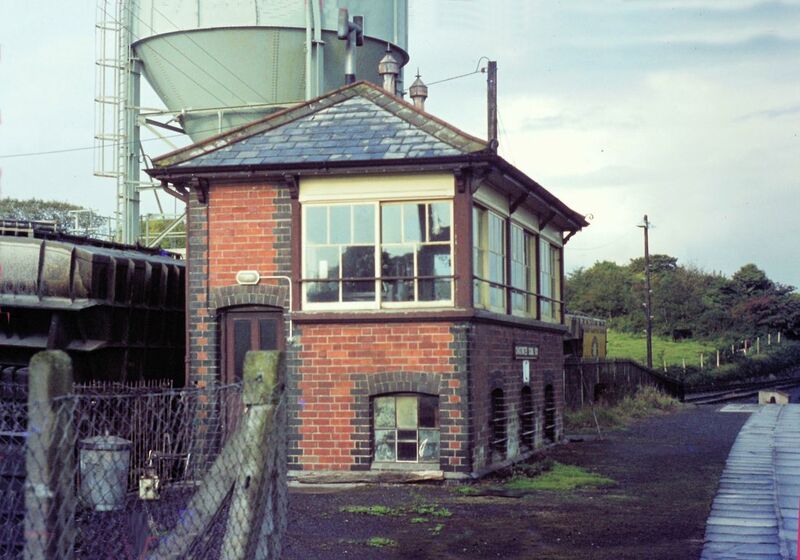 No toilet was provided, signalmen had to use those on the station. Inside the box was equipped with a coal burning stove with an oven on the top, a Valor oil stove to boil the kettle in thye summer and two paraffin lamps for lighting. 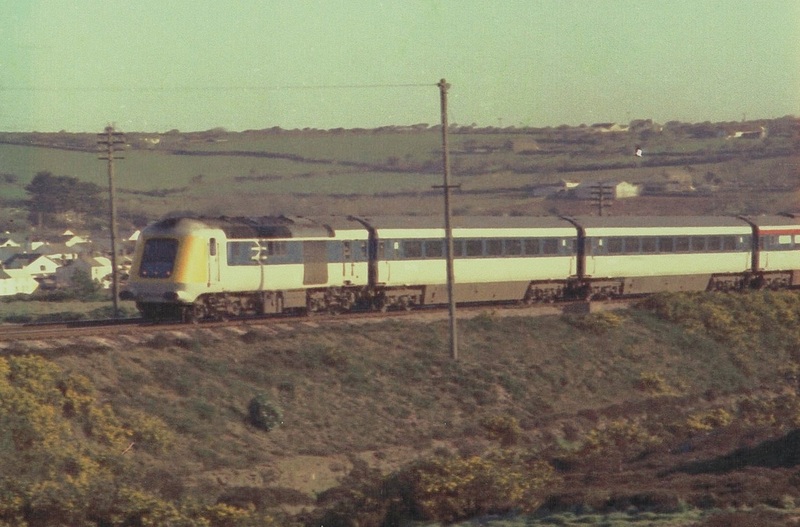 It had a 35 lever fram, up and down absolute block instruments and an electric token instrument for the section to St Agnes on the Newquay branch. In order to put the token and carrier on the picking up post the signalman had to walk to the end of the platform, across the main lines and across to the branch on a wooden walkway. 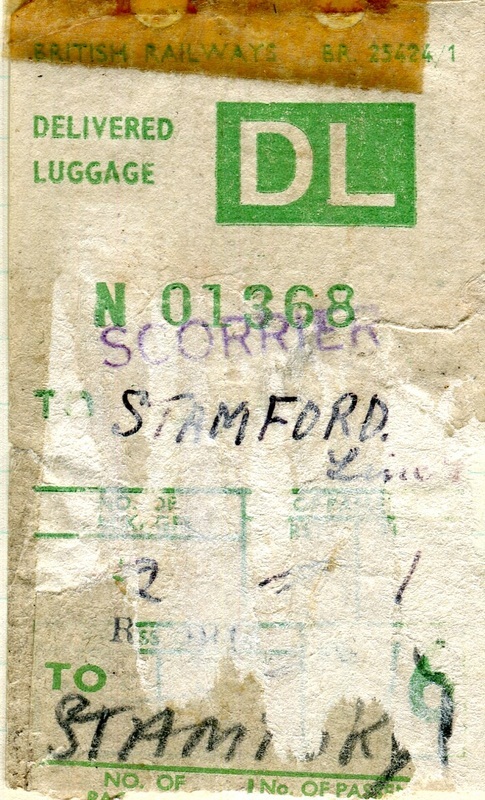 The reverse applied when the token had to be collected from the setting down post. As can be seen from the sketch map Chacewater station was built on a curve and there was quite a cant on the main lines, especially the down. 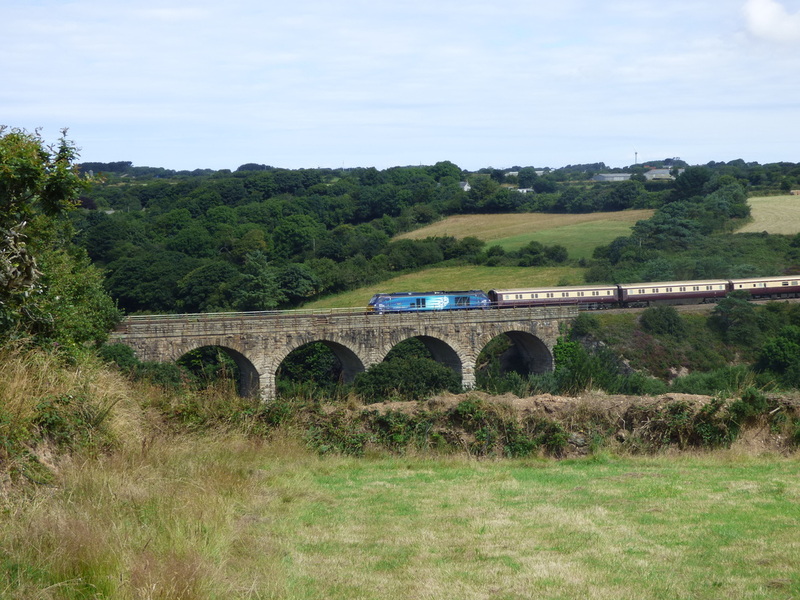 There was a facing point in the down main line on the viaduct quite a way from the box to switch Newquay train, which originated from Truro, into their branch platform and independent line to what was once Blackwater Junction and triangle. This frequently used point had a reputation of being a ‘hard pull’. 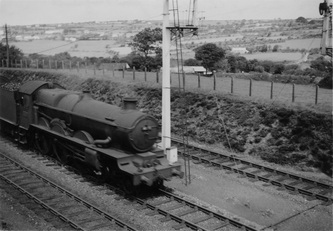 The lineman spent quite a lot of time at Chacewater adjusting this point and its facing point lock. 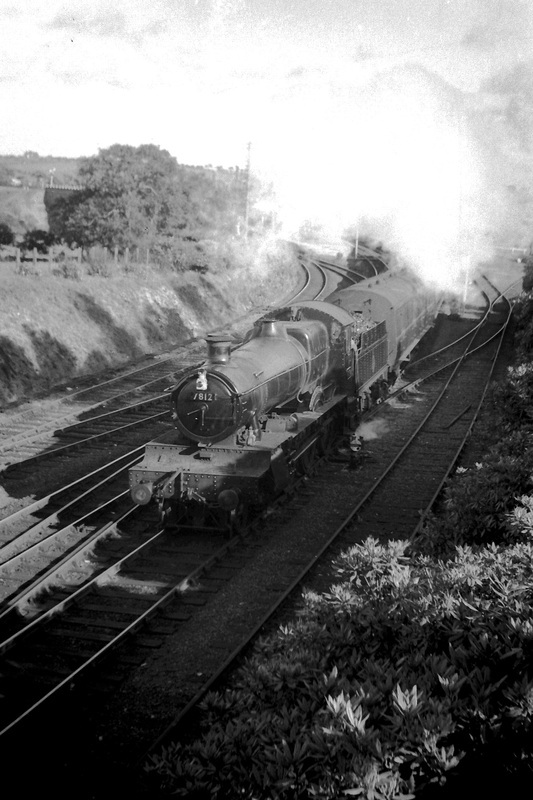 The difficulty was that, of the regular signalmen, one was tall and well built while the other was short and wiry. Having adjusted the linkage successfully for one signalman when the other came on shift there would be problems. 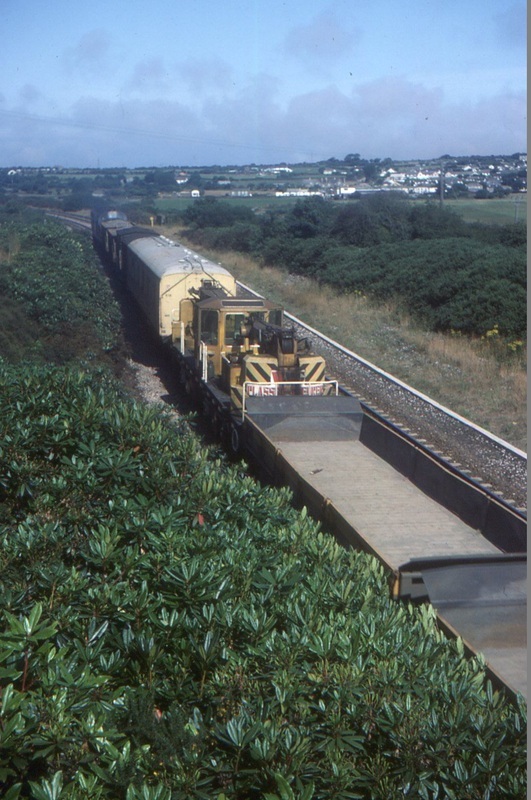 One awkward job at Chacewater was to attach the wagons to an up main goods train. You to stop the train outside the up home signal pin down the brakes as the train was on a falling gradient and, uncouple the engine and send the engine forward clear of the cross over. 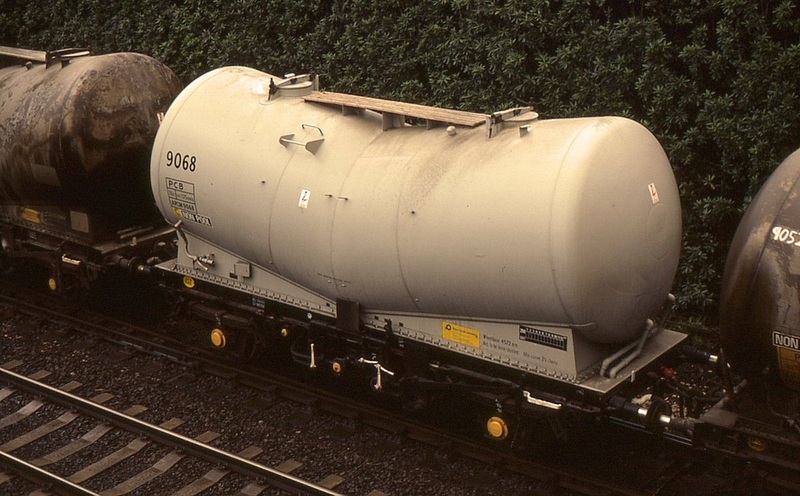 If the down main was clear you could cross over the engine and put it in the sidings to attach the wagons which it would then draw back out through the crossover and berth in the up platform. 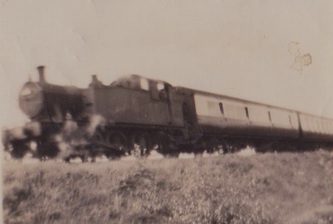 The loco would then uncouple and reverse towards it original train . 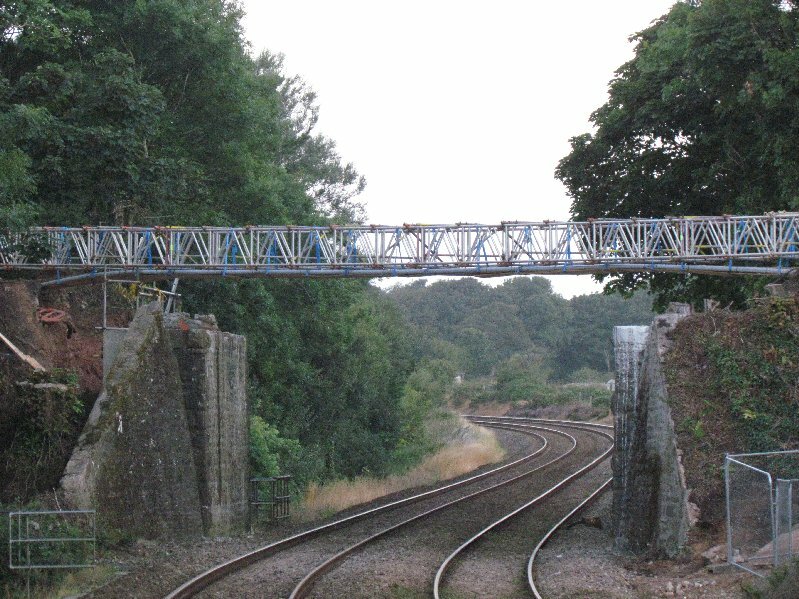 Once clear of the point it woud then run through the branch platform and onto the up main on the viaduct before setting back onto its wagons in the platform, and in turn onto the rest of its train before coupling up, releasing the brakes and “Right Away”. Reference to the track plan MAY clarify these moves! This shunt would not delay the branch as you could accept it under control of your signals under Reg.53.5.5. 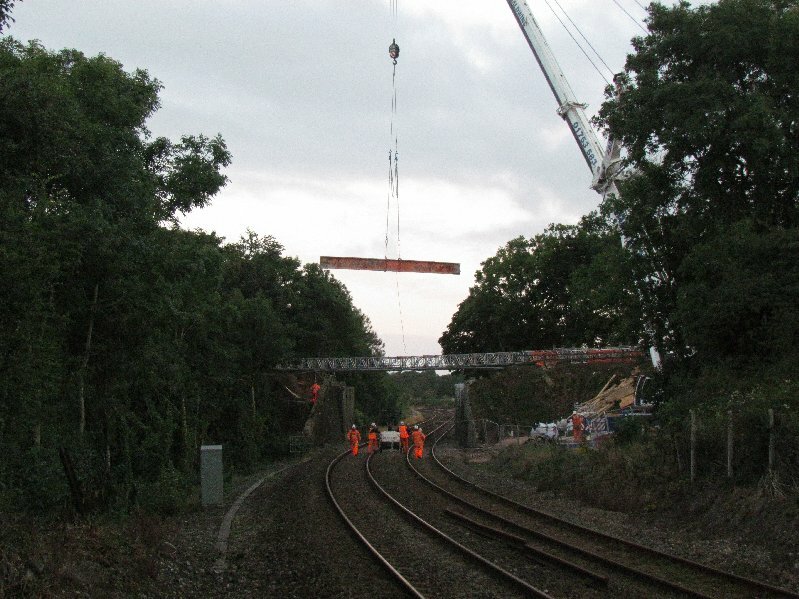 –section clear, station blocked. 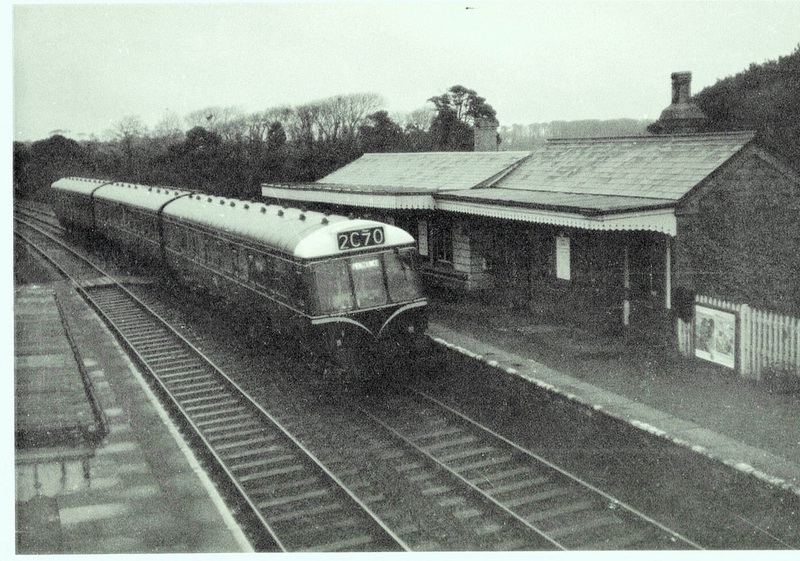 As per the footnote on display in the signalbox. 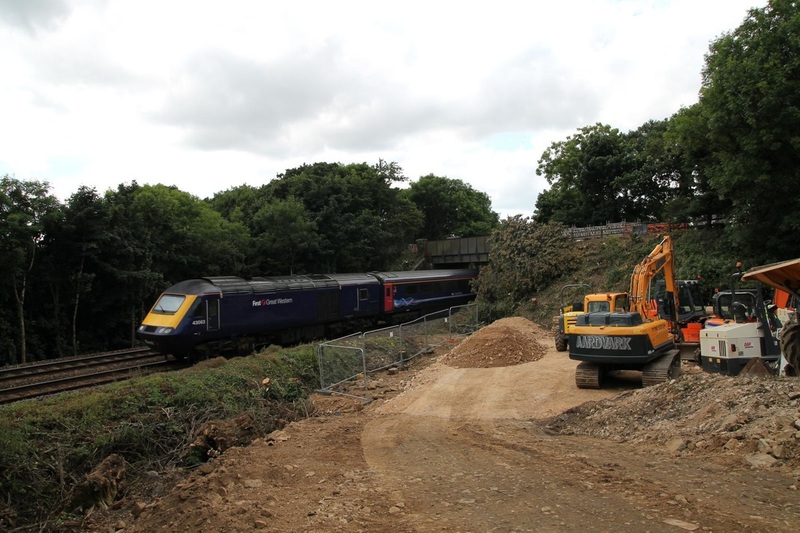 Obviously our railway work was carried out in a dedicated and professional manner, but I worked with some great characters and there was always time to enjoy the lighter side of life. On the station at Chacewater there were some beautiful dahlias in the flower beds. 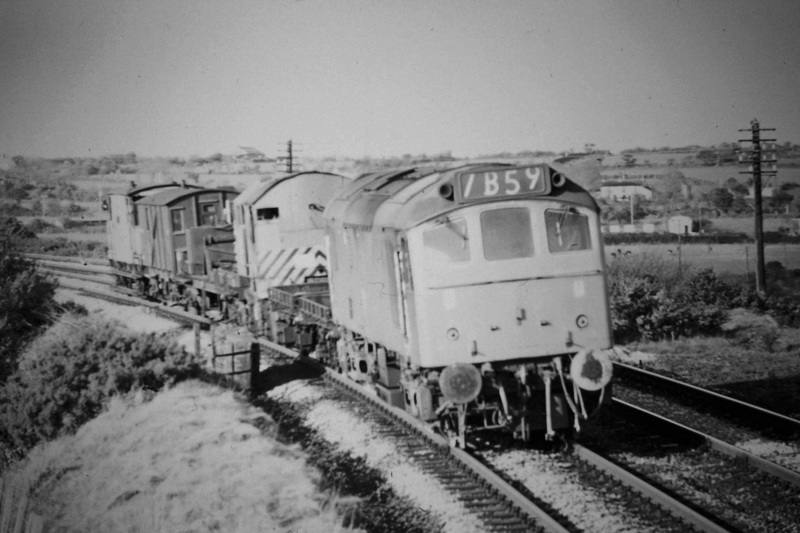 These were supplied and tended by Bill the porter. 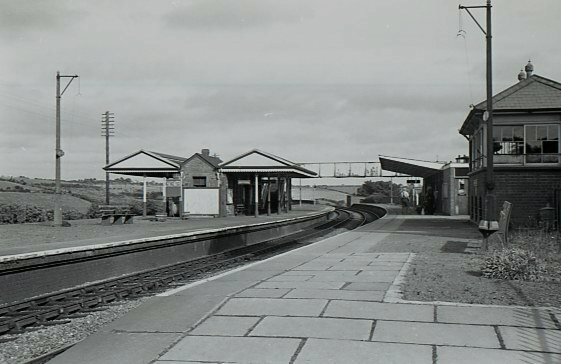 Once, when I was relieving at Chacewater for a week “someone” told Bill that I had some dahlias in my garden at home exactly like those on the station and that I might have “obtained” some tubrs from one of his flower beds. 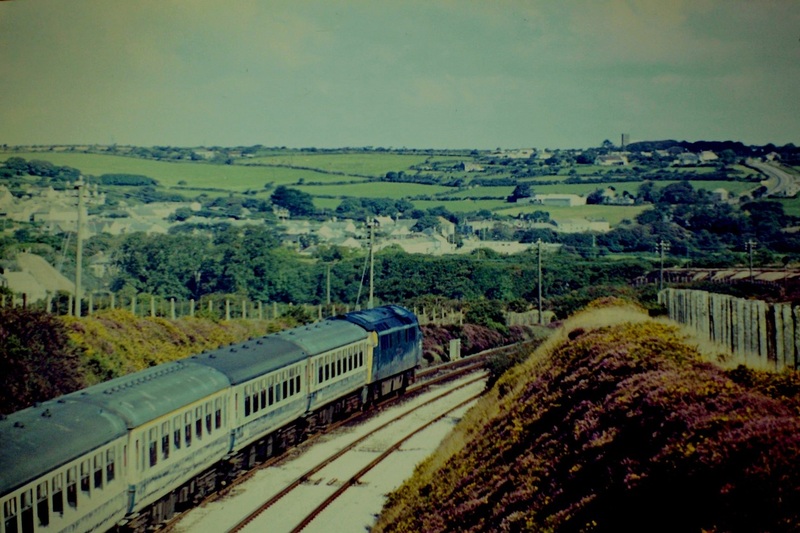 When I was porter signalman at St. Agnes I used to cycle to and fro from Camborne. 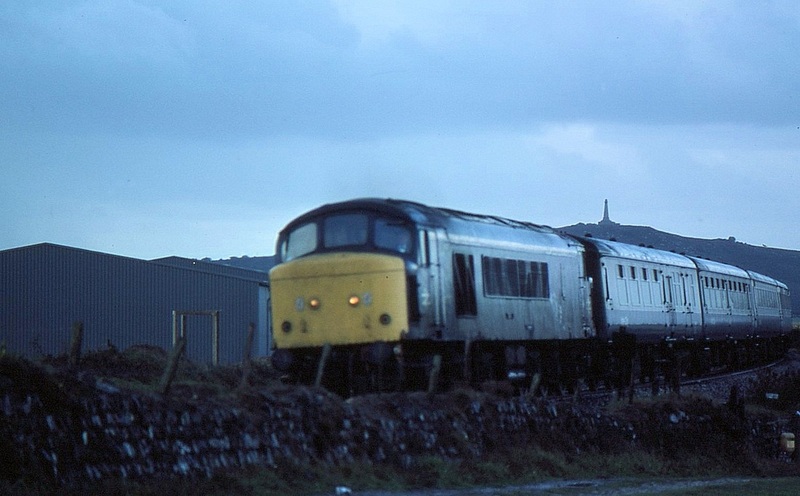 On finishing a Friday early shift on a wet and windy day I decided to return home by train. 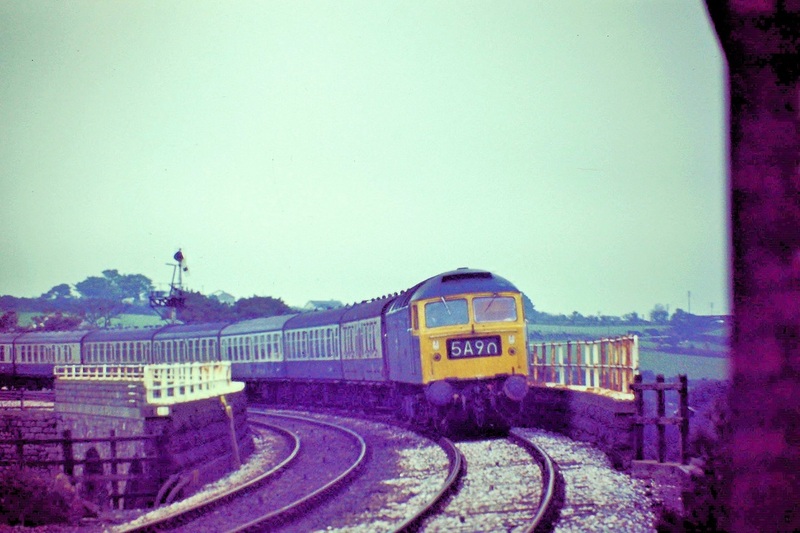 I rode the branch train to Chacewater and crossed to the down platform for the connection westwards. 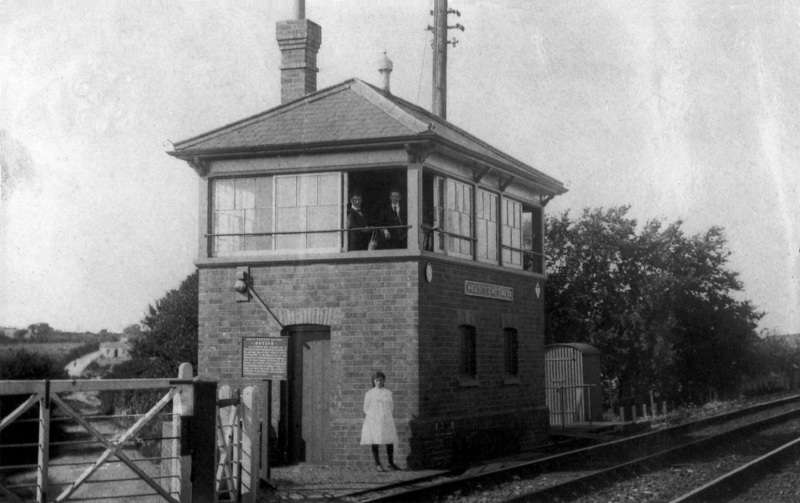 This was running late so I went up into the box to have a chat with Tommy, the regular signalman who lived in the railway house. Tommy was crouched low over (the already mentioned) oil stove looking into a saucepan (which had no handle) containing something that was going full blast. He explained that he had cycled in Redruth market that morning and bought some tripe which he was going to have for his tea accompanied by some bread and butter and that he was willing to share it with me. Fortunately, a beat on the bell announced the imminent arrival of my train so I had to leave Tommy to enjoy his feast alone! 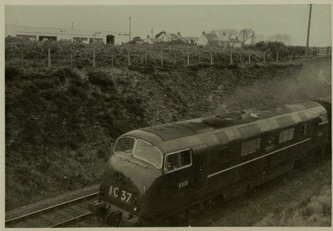 All the way of life was to change as the Newquay branch closed in February 1963. 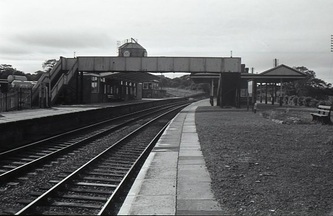 The station on 4th October 1964 and the box itself in June 1977 when it was replaced by a ground frame to operate the remaining two sidings. These remaining in use for cement traffic until 1987. 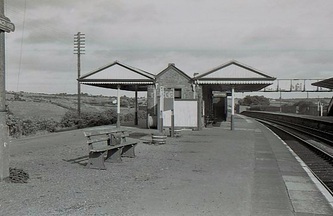 The ‘new’ down station building remains in commercial use. 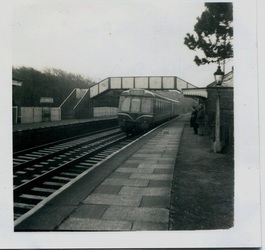 This was erected in the mid 1950’s to replace the older one which was destroyed by fire. I wonder if it still smells of parsnips…..
​Within minutes of Rogers picture appearing on the site, Roy Hart, from far off Burma comes back with this very welcome information. Many thanks Roy. 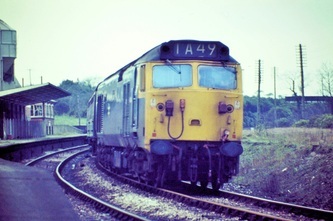 Chacewater Signalbox April 1973 Copyright Roger Winnen. The reason for the 'C' on the box was queried - see a full answer from Roy Hart below. 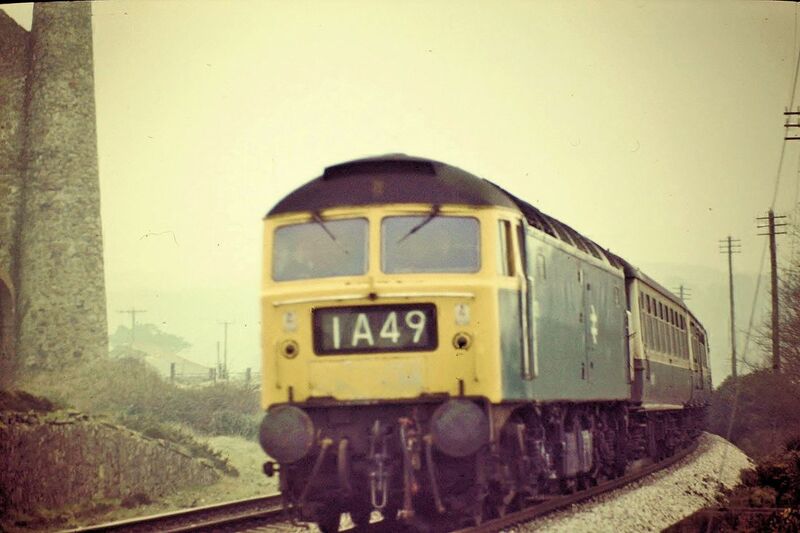 It is April 1973 as an unknown Western prepares to 'open up' for the climb to Apex Summit. Copyright Roger Winnen. 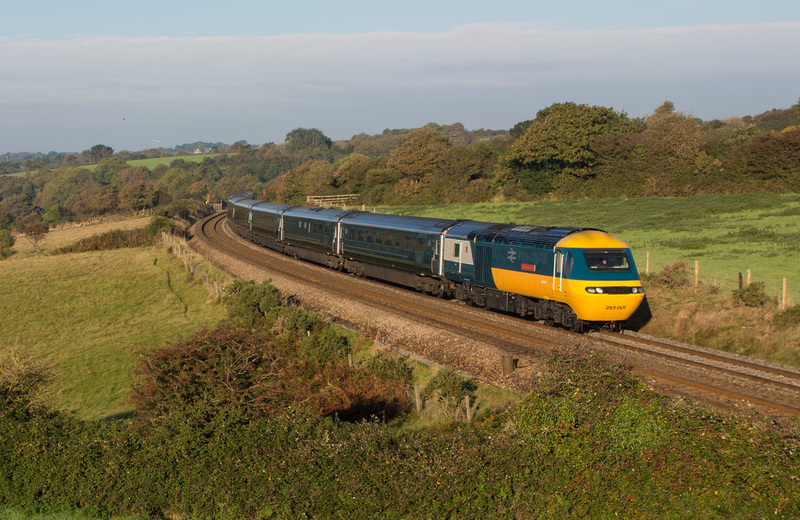 The celebrity train tops the bank east of Chacewater on 14th October 2016 Copyright Keith Barrow. 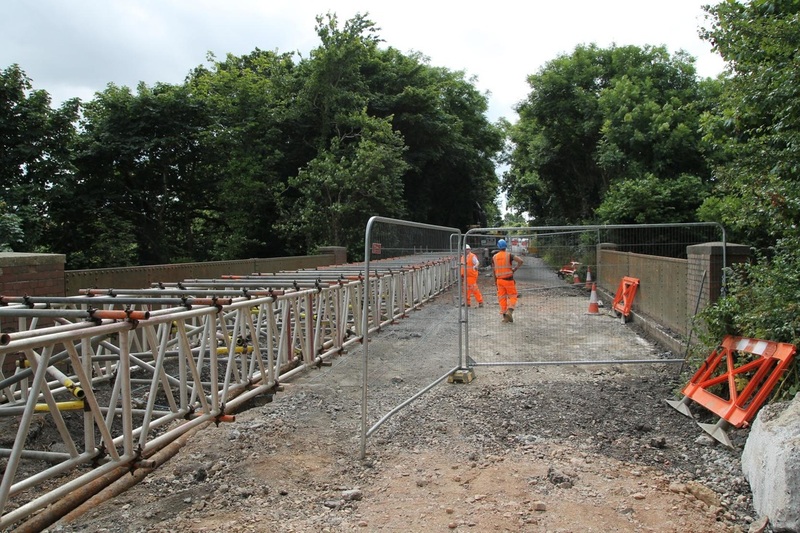 Hi Keith, I popped down to the work site at Greenbottom adjacent to Saveock Crossing yesterday to see progress on the over bridge on the Chacewater to Threemilestone road. 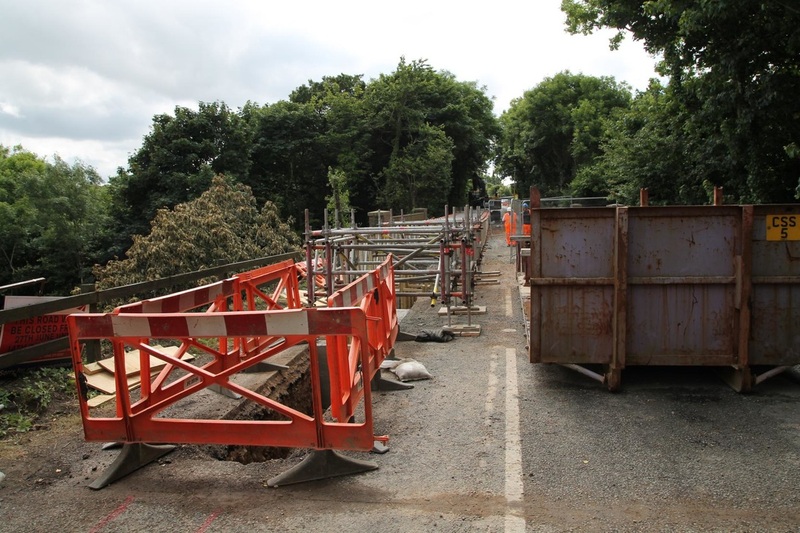 The lengthy road closure has been necessary to deal with the new bridge being installed. Painstaking preparations have included releasing fibre optic cables from concrete casing along the structure under the former road bed. 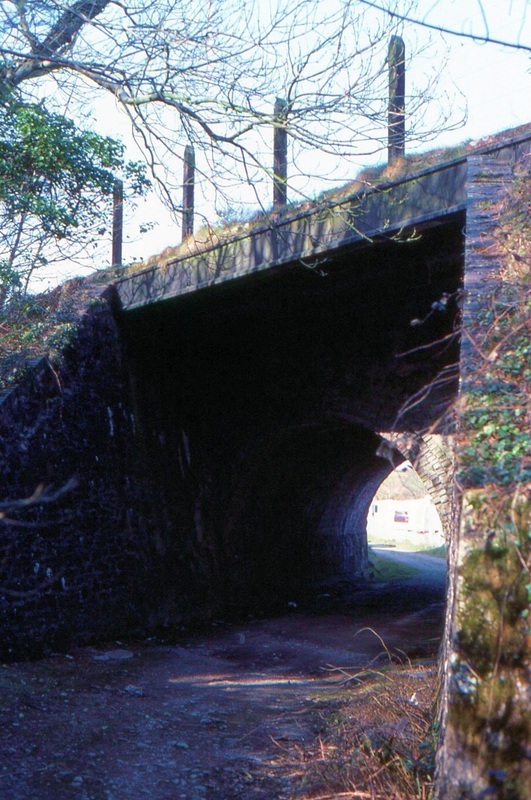 This trench can be seen in the picture taken on the former road. 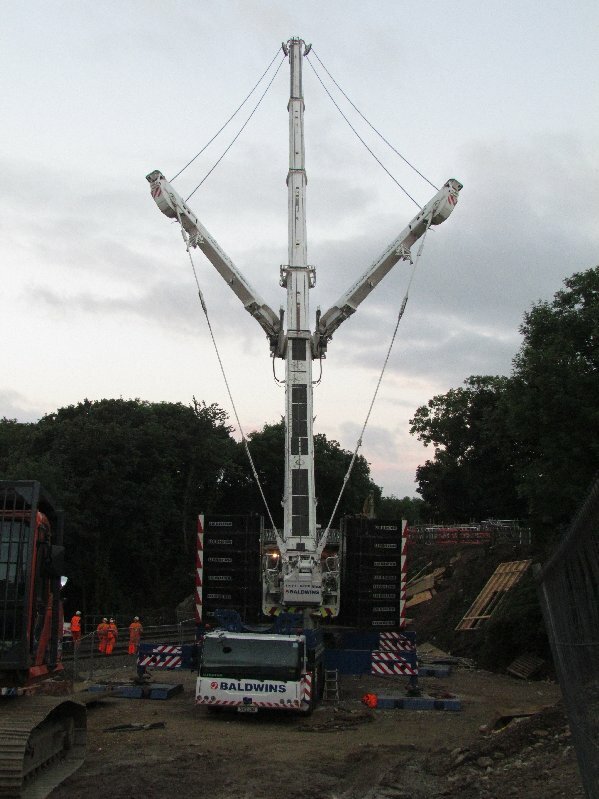 The work to take out part of the deck happens on the weekend of 23/24th July. 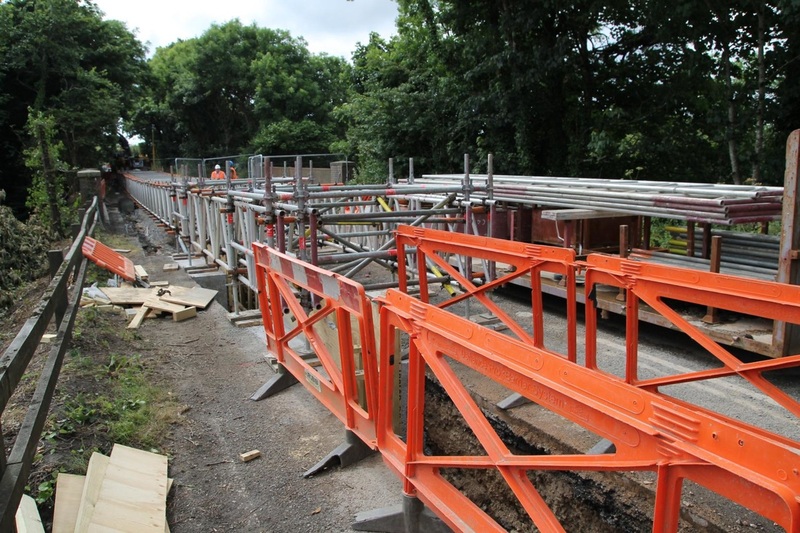 These pictures will be some of the last of the original bridge deck. 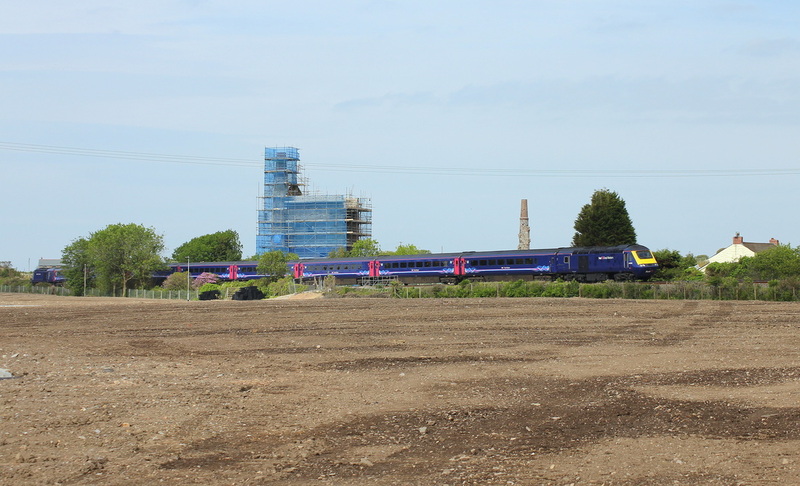 An extensive paddock area has been created, and much vegetation cleared, giving a rather nice view back towards Chacewater on the Up from Saveock Crossing. 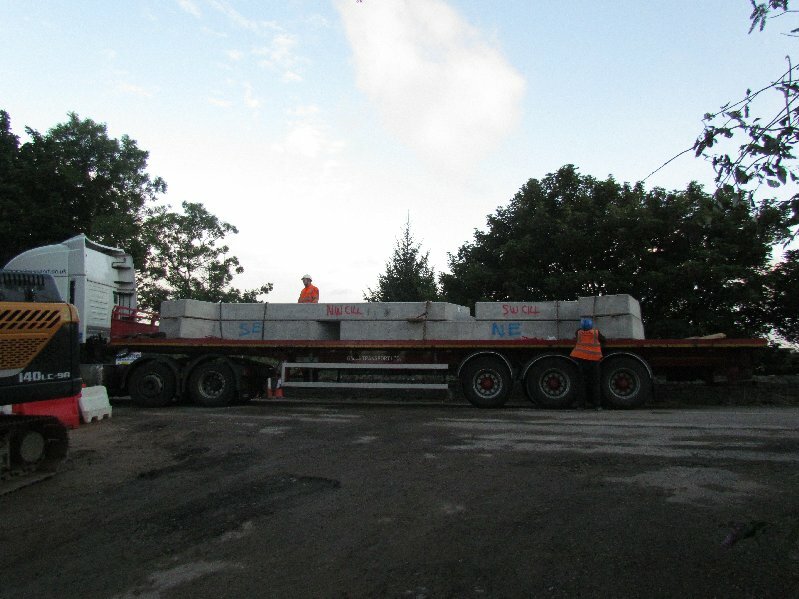 Parapets of the new bridge arrive. 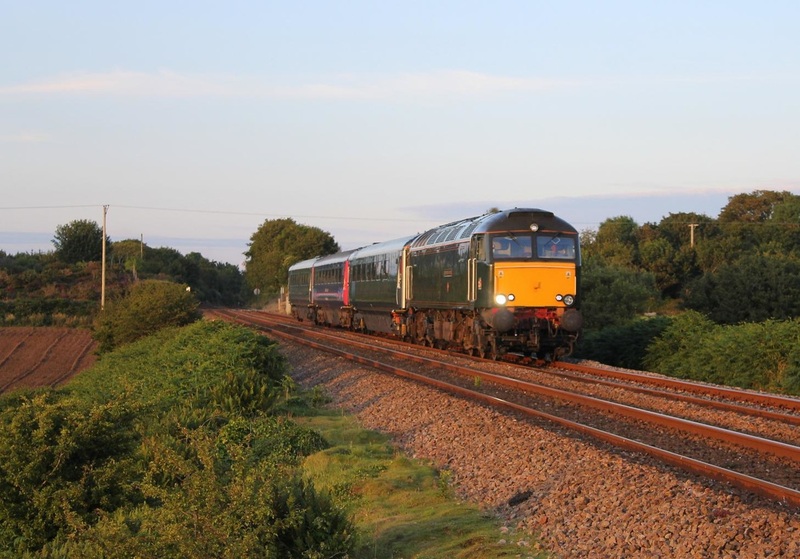 21st August 2016 Copyright Mick House. The Baldhu Signal Box that I knew in the 1950.s was situated near milepost 304 and was opened in September 1938. 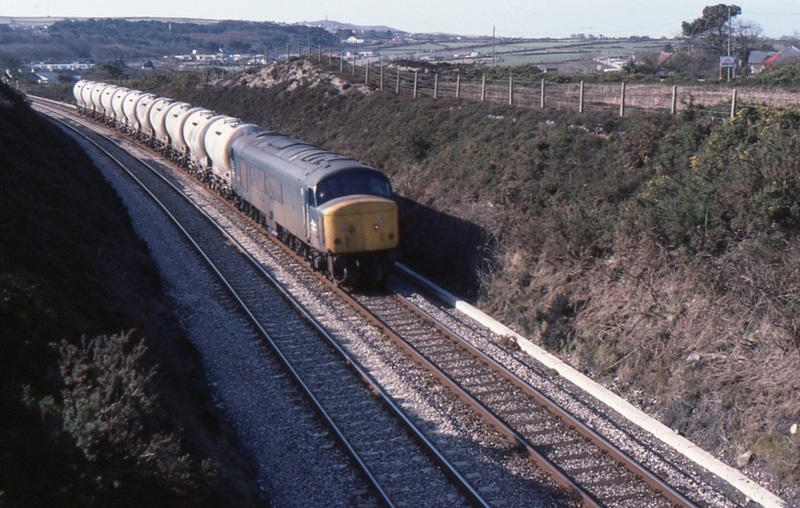 Its purpose was to shorten the section between Penwithers Junc. 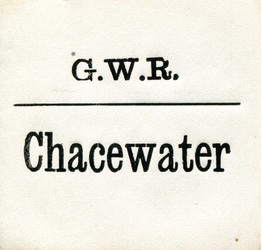 and Chacewater. 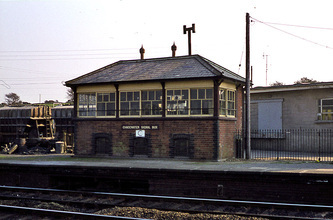 The box was constructed with the usual brick base and had large wooden sliding windows. Access steps were outside and there was a chemical toilet at the top. It was open throughout the day and was operated by early and late shifts. 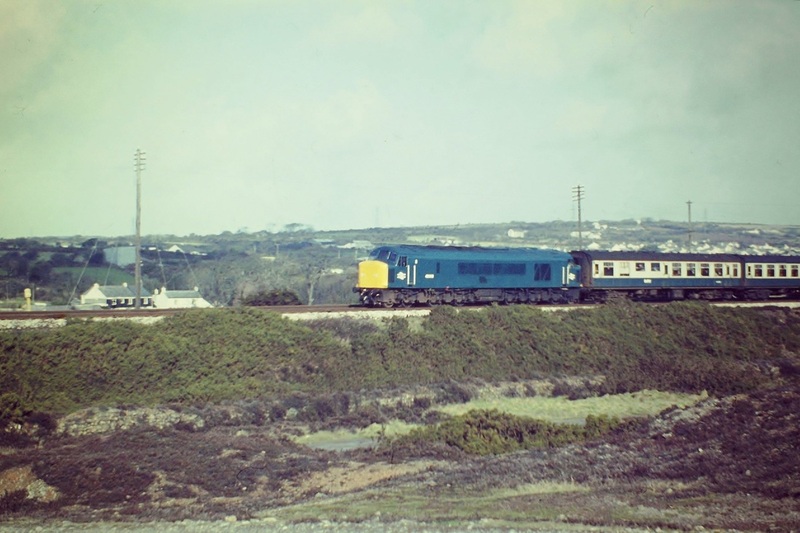 On occasions I worked there I reached it by turning off the Chacewater – Truro road and rode my motorbike past a farmhouse where one of the regular signalmen lived. 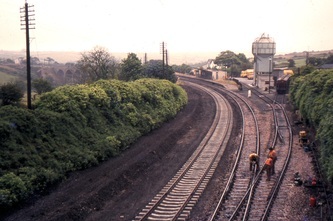 The job was known as a ‘snip’ as the frame consisted of two signals (distant and home) on the up and the same on the down. There was also a detonator placer operated by a black and white lever. 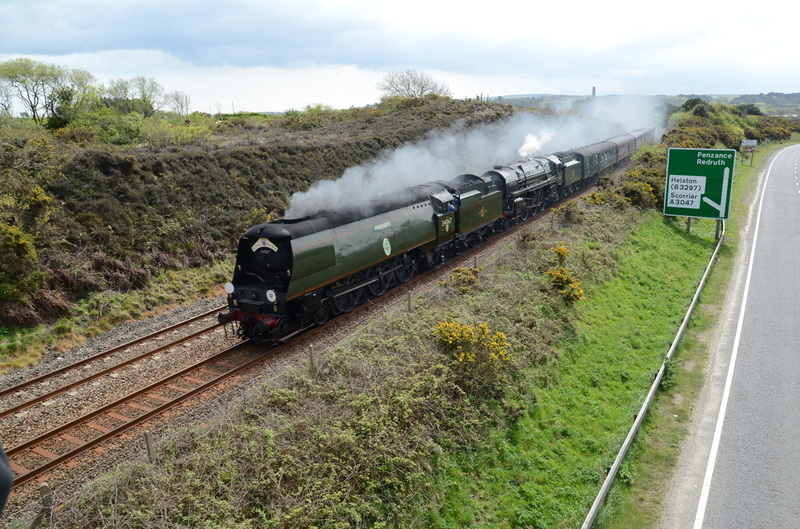 It was a great vantage point to watch a variety of steam hauled trains running past. 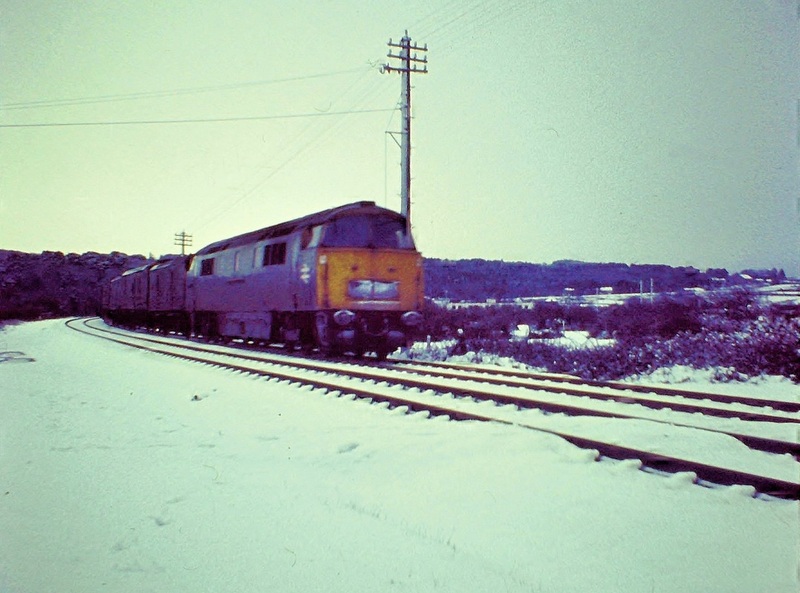 Comments were made about the regular signalman who worked there for many years and had never pulled a pair of points during his entire career! 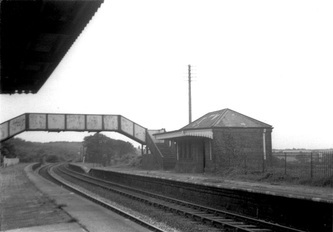 Baldhu box closed on the 10th March 1957 and was replaced by a colour light signal intermediate block signals controlled by Chacewater on the up main and Penwithers Junction on the down. 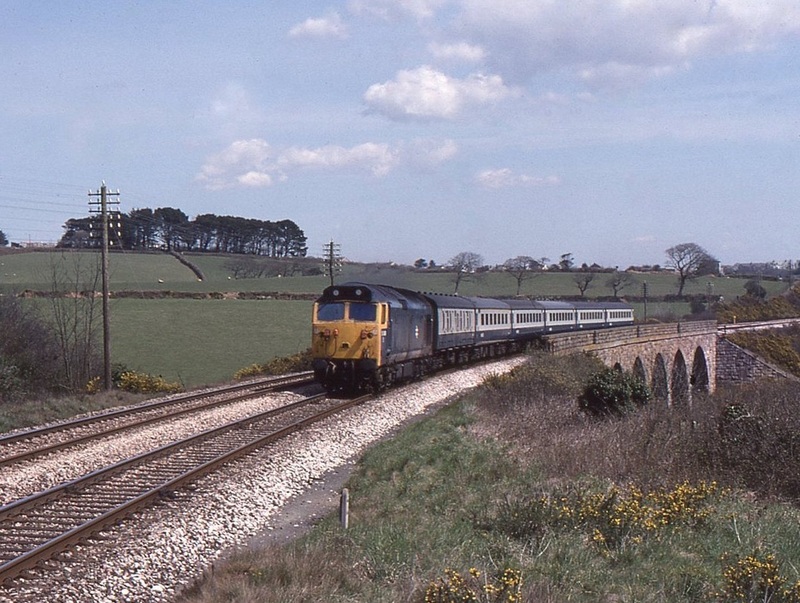 The running lines were track circuited all the way up to their respective IB home signals. 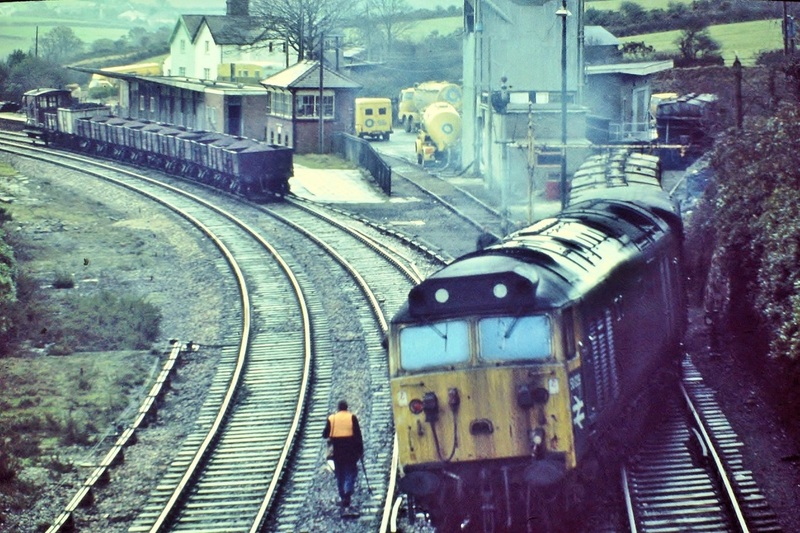 If the line was clear to the IBS the signalman at the rear could lower his signals, including the distant, to allow a train to proceed to the IBS. If a train was stopped at the IBS the driver was required to contact the signal box at the rear using the signal post telephone in order to carry out rule 55 (train detained at stop signal). 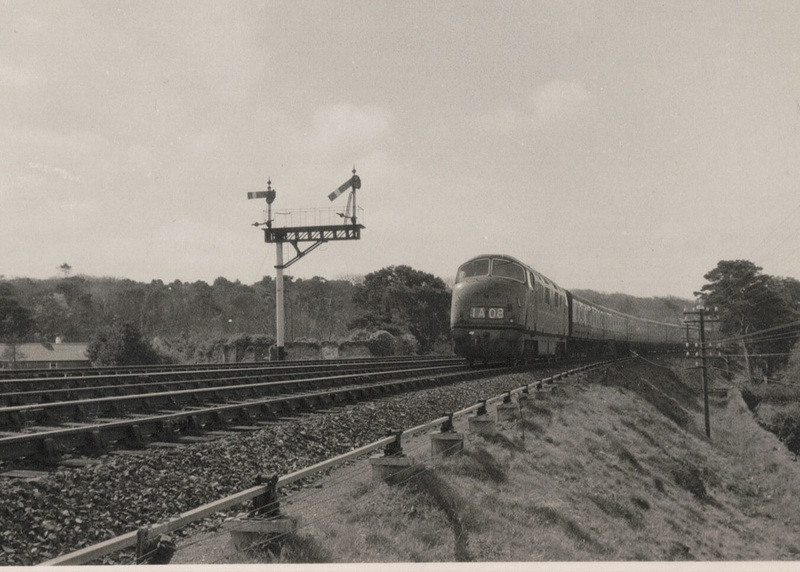 The signalman then had to sign the train register and place a collar on the signal controlling the entrance to the IBS section to remind him that it must not be pulled off until the line is clear. 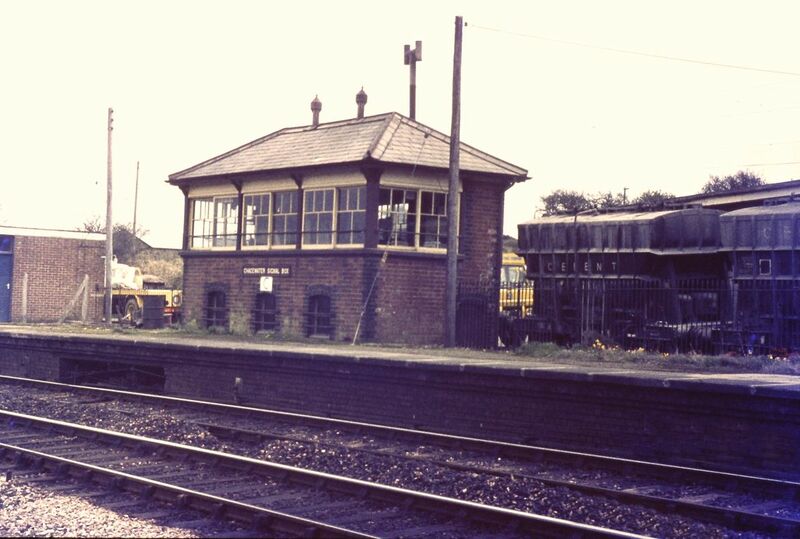 Today trains speed past and there is very little evidence that a signal box ever existed at the site.